In 25 hours, the polls will be closed, and all of this will be history. Elections, as I have said, come down to a lot of things, but in the end they come down to one thing: math. So let’s sort through it, piece by piece. I may repeat some of what I have already said below, so you don’t have to get finger cramps scrolling through this data-drenched blog. So the first math problem is to figure out what the likely Dem statewide lead is going into Election Day based on these numbers. So keep those numbers in mind as we proceed. So first thing you can see from these numbers is that if the Republicans can keep Clark County turnout to a minimum or hold their own, they can make up a lot of ground if the rurals turn out Tuesday. But is that likely to happen? What this tells you is that if the Rs win Election Day by 5 percent, that will almost surely not be enough. If they win by 10 percent, which would be extraordinary, it could be. In 2014, the year of the red wave in Nevada, the GOP won Election Day by 7 points. The Dems won Election Day in 2012 (by 4 points) and 2016 (by 2,000 votes). But it’s worth noting, the Dems actually lost in actual votes on Election Day two years ago and had 3.5 points shaved off their ballot lead, partly because of a bad run with the 100,000 or so indies who turned out. And herein, maybe more so than rural turnout, which cannot offset Clark turnout and the Washoe break-even, is Heller’s hope — and that of other statewide Republicans. There are still 300,000 or so non-major-party-voters out there. Let’s say 30 percent turn out (that would be high) or 90,000 voters. If Heller and other Republicans can win them by double digits, he has a chance. I should say that no data exists to say that is happening. Quite the contrary. But Nevada has bucked national trends before — and so has….Heller (see 2012). As I have been saying, watch when the first Clark results pop up between 7 PM and 8:30 PM, the tally of the early and mail ballots. If Heller is behind by 10 percentage points or more, he is probably going to lose. Washoe is unlikely to save him this time — check those first numbers from there, too — and there probably aren’t enough votes left in the rurals. But if he is behind by single digits in Clark, a rural surge could put him over the top. One note specific to the governor’s race: While Heller lost Clark by almost 10 and won Washoe by 20,000 votes the last time he squeaked by, Laxalt lost Clark by almost 20,000 votes (only 6 points) and Washoe by 2,000 votes but swamped Ross Miller in the rurals to win. So watch his Clark numbers, too, this time: If Steve Sisolak does not have a double-digit lead, he could be in trouble. That’s all he wrote, folks. For now. If you find math errors or typos, you know where to find me. Don’t forget to tune into IndyTV tomorrow starting at 6:30 PM for numbers and analysis. The numbers (still no five rurals) show the Dems with a 3.5 percent lead — I always thought 3 percent might be enough of a cushion. One of the great things about doing this blog — and this happens more every year — is fellow data geeks tweet stuff at me that is very useful and has data points I don’t have time to extract. That last one will be instructive as I extrapolate the Tuesday vote tomorrow and/or Monday. The point is simple: There are not nearly as many votes out there on Election Day as we have seen so far. Overall turnout is about 40 percent now; Dems are at 43.6 percent, Rs at 45.6 percent and the rest at just under 30 percent. I expected about 600,000 to vote early, so I was close (630,000). It’s clear, even though this is an odd election, a hybrid of a midterm and a presidential and about 80 percent of the latter, that turnout Tuesday will be between 20 percent and 30 percent of the state’s 1.5 million active voters. That means between 300,000 and 450,000 voters can be expected to go to the polls. The latter seems awfully high — that would be a 72 percent turnout. But the former may be a little low — 62 percent. Maybe the midpoint — 375,000 — is the best guess. That would be 67 percent, still high for a midterm. I’ll start looking at various scenarios soon. Now for those predictions…. As I prepare to do some modeling of Election Day later, here is a look at the relationship in the last four cycles between early/mail voting and Election Day, as well as the total turnout for those cycles. As you can see, while there is no obvious pattern, what is true is that the percentage of early/mail goes up in presidential years over midterms. This has been a hybrid so far — more than three-quarters of 2016 turnout — so we can expect Election Day to be one, too. One other thing: I had forgotten there were some precincts that vote by mail because they are so small — they accounted for a few thousand votes the last two cycles. The Republicans have about a 900-vote lead there so far, so that will reduce the statewide lead to closer to 22,000, or 3.6 percent. I’ll update the statewide numbers when those other rurals come in. Democrats had their best last day of any midterm in history, with waves in Clark and Washoe that boosted the urban firewall to close to 50,000 — 47,000 in Clark and 1,800 in Washoe. 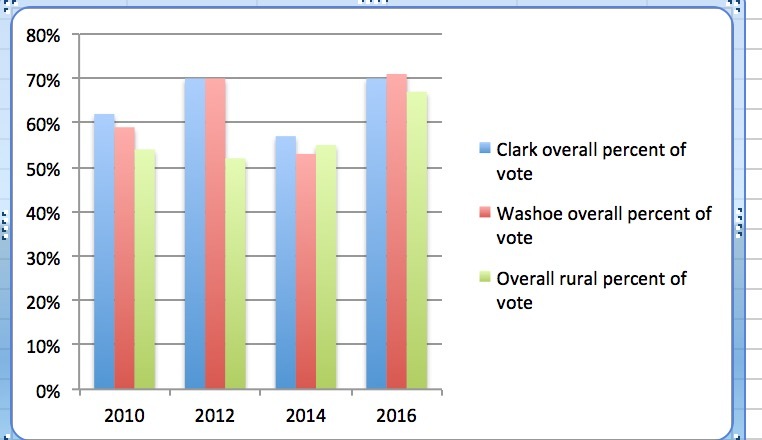 The rurals (not all are in) cut into that lead by almost 2,000 voted Friday, but the 9,000-ballot edge in Clark (almost 20 percent win) and 1,000-ballot edge in Washoe far outstripped the usual rural hemorrhaging. The statewide lead, once the rurals all report, will be about D+23,000, or 3.7 percent. The Clark lead is now 45-34, or just two points under the reg edge, so if there is not much base-bleeding and if indies are not going big for the Repubs, Steve Sisolak and Jacky Rosen will have double-digit leads coming out of Clark. 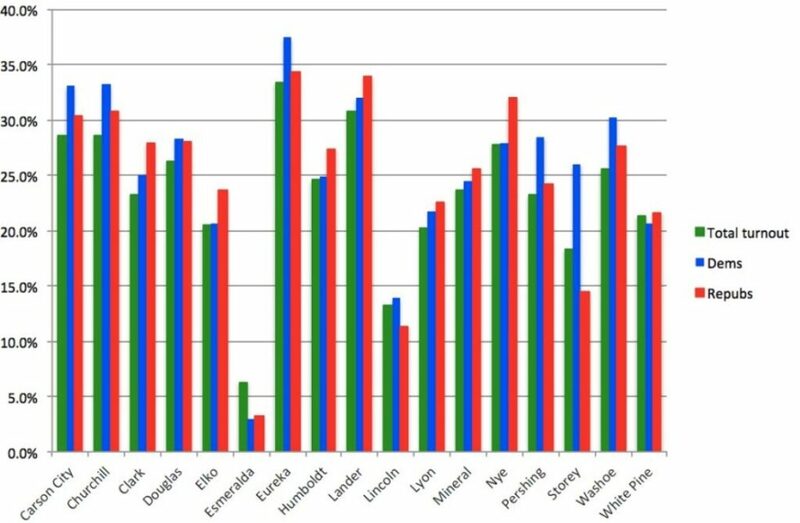 Washoe seems very, very unlikely to help Repubs (Dean Heller won it by 20,000 votes during his 2012 miracle win), and the rurals are not very far above their actual percentage of the state vote — about half a percent — to do enough damage on Election Day (this ain’t 2016) unless there are a LOT of folks in those 15 counties who waited. It’s possible, just not likely. The bottom line: Republicans need a really good day Tuesday to stop Democrats from at least a pastel blue wave and it may get to navy blue if the Dems hold their own on Election Day. It appears that these elections are breaking for the Dems at the end. If I were Dean Heller, who has bucked large firewalls before (see 2012) and Adam Laxalt, I would be worried. —If Dean Heller and Jacky Rosen are holding 90 percent of their bases and getting 5 percent of the other’s and each is getting 45 percent of indies: Rosen is ahead by nearly 20,000 votes, or 3.1 percent..
—If they are at 90-5 with the bases and Heller is ahead by 50-45 with indies: He is losing by almost 13,000 votes, or 2.1 percent. —If they are at 90-5 with the bases and Rosen is ahead by 50-45 with indies: She is ahead by more than 26,000 votes, or 4.2 percent. —If they are at 90-5 with the bases and Heller is ahead by 50-40 with indies: He is losing by 5,500 votes, or about 1 percent. —If they are at 90-5 with the bases and Rosen is ahead by 50-40 with indies: She is ahead by almost 32,000 votes, or 5 percent. So you see how well Heller will need to do on Election Day, unless he is ahead with indies by a lot. CD3 (Danny Tarkanian vs. Susie Lee): Dems +4,500 (2.3 percent), Dems gained significantly. This is lean D now, but Tark still has a chance because this is an R-performing district (Trump won by 1). CD4 (Steven Horsford vs. Cresent Hardy): Dems +17,000 (13 percent) in the Clark part, which is more than 80 percent of the district. Hardy needs a rural miracle. SUPERMAJORITY WATCH (Dems need to sweep the three competitive state Senate races and net one in Assembly): Dems are going to win a state Senate seat (Becky Harris’s), and the GOP is poised to pick up only one Assembly seat but could lose two others. SD8 (Republican Valerie Weber vs. Democrat Marilyn Dondero Loop)— Dems+600. Big Dem gain. Lean Dem. But far from over. SD9 (Republican Tiffany Jones vs. Democrat Melanie Scheible) — +3,000 Dems. Say hello to Sen. Scheible. SD20 (Republican Keith Pickard vs. Democrat Julie Pazina) — +600 Dems, big D gain. Slight lean D.
Supermajority in sight unless GOP turns it around Tuesday. Still possible if indies breaking GOP way. In the key Assembly districts, the GOP is favored for one Washoe pickup to get to 16 seats but two of their Clark seats look increasingly in jeopardy and the Dems all look safe from these numbers. The Dems only need to net one to get to a supermajority, and what’s worse for GOP is the big day on Friday put some Lean R seats back into play. AD2 (Republican John Hambrick* vs. Democrat Jennie Sherwood)— GOP +200, big D gain. Goes from likely R to lean R.
AD4 (Republican Richard McArthur* vs. Democrat Connie Munk) — Dem +75. Tossup. AD21 (Republican Cherlyn Arrington vs. Democrat Ozzie Fumo*)— Dems +1,000, about the same. Likely D.
AD22 (Republican Melissa Hardy vs. Democrat Kristee Watson) — GOP +500, about same. Likely R.
AD29 (Republican Stephen Silberkraus vs. Democrat Lesley Cohen*) — Dems +1,000, D gain. Likely D.
AD31 (Jill Dickman vs. Skip Daly*) — GOP +550 (no new numbers yet). Strong lean R.
AD35 (Republican David Schoen vs. Democrat Michelle Gorelow and indie Daniel Hofstein) — Dems +1,600, D gain. Likely D.
AD37 (Republican Jim Marchant* vs. Democrat Shea Backus) — Dems+150, D gain. Toss-up. AD41 (Republican Paris Wade vs. Democrat Sandra Jauregui*) — Dem +1,100,D gain. Likely D.
Supermajority possible here, too, but still unlikely unless GOP does not win Election Day. That’s it for now. I will do some modeling and extrapolations of various Election Day scenarios later this weekend. This early voting fortnight has been so fascinating to watch and is unlike any I have covered. There has not been any obvious pattern, the Washoe numbers are striking and the rural margins are eye-opening. What is most clear is that this is not 2014, the Democratic disaster because of a red wave that washed away the party’s bench. But the two huge upsets — Ross Miller losing for AG and Steven Horsford for Congress — were still nail-biters despite the overwhelming wave. The Reid Machine, still overseen by Reidites and some talented young folks, has been gassed up this cycle, probably achieving a 10 percent-plus ballot lead for the Dems in the South., where two-thirds of the votes will come. On the other side this cycle, there has been imitation and the sincerest form of flattery: The Republicans are very cleverly running a rural-focused turnout program, complete with a ton of absentee ballots, a copycat of the Democrats’ efforts every two years to bank votes in their stronghold before Election Day. Of course, Republicans can never compete with the volume in Clark County, but by ensuring the rurals would give them a huge lead in early and mail voting, the GOP has stayed in the game. And while the margin in Clark will be very large for a midterm, it has not gotten so big that the game is over before Election Day, as it has been in the last three presidentials. The seminal question of this election here is at what cost has the GOP played the Democrats’ game? That is, there is evidence in the data, sources tell me, that the Republicans have turned out a lot of folks who are reliable voters, the kind who usually turn out on Election Day. Meanwhile, there also is evidence that Democratic-supporting groups, such as NextGen and Win Justice, have turned out many more infrequent voters than have ever cast early ballots before. And the Democrats have matched the GOP absentee ballot campaign in Clark and now lead there in mail returned. This is a dynamic we have not seen before where the GOP, which always has a solid turnout edge in midterms, has to draw from a less reliable pool than usual on Tuesday while the Democrats have a larger inveterate universe than they usually do that has not voted. Yes, the Republicans will be in better shape than they were in 2016. But this is not only apples to oranges despite the higher turnout for a midterm (three-quarters of 2016), it misses the atmospherics going on around the country: It’s the reverse of 2016, when the Democrats had banked all of those votes but the Republicans had all the momentum going into Election Day and slashed more than half of the early lead. This year, the Democrats appear to have the wind at their backs, but will it be enough to offset the usual GOP midterm and Election Day advantage? The other mystery is the 100,000-plus non-major-party voters, who went for the GOP in 2016 and have tended to be more conservative. Reliable polling is contradictory on this, with some showing them going for Dems this time and others for the Repubs. And it’s not just about which way they are leaning; it’s by how much. Here’s what I know among the unknowns: The Democrats are slightly better positioned right now, but both parties are nervous about Election Day and both still believe they can win the races for governor or Senate. The composition of the early voting electorate indicates an advantage for the Democrats. But if the Republicans can win Election Day by a decisive margin, the top two contests could be very, very close. Of course, just as I posted the last update, the SOS updated the remaining rurals. As I expected, 14,500 lead for Dems, or 2.6 percent. The models don’t change much with added votes, so I won’t do them again. Same outlines hold: Heller needs to win indies by double digits or Rosen must be losing her base more than he is for him to be ahead. —If Dean Heller and Jacky Rosen are holding 90 percent of their bases and getting 5 percent of the other’s and each is getting 45 percent of indies: Rosen is ahead by nearly 13,000 votes, or 2.3 percent..
—If they are at 90-5 with the bases and Heller is ahead by 50-45 with indies: He is losing by almost 7,000 votes, or 1.3 percent. —If they are at 90-5 with the bases and Rosen is ahead by 50-45 with indies: She is ahead by more than 18,000 votes, or 3.3 percent. —If they are at 90-5 with the bases and Heller is ahead by 50-40 with indies: He is losing by 1,500 votes, or .3 percent. —If they are at 90-5 with the bases and Rosen is ahead by 50-40 with indies: She is ahead by almost 24,000 votes, or 4.3 percent. Heller is up by 3,500 votes, without accounting for the 8 percent undecided in the poll. Turnout was 10,400 in Clark at 11:30, so it’s going to be a big day. I’d say 30,000 at least, maybe 35-40,000. Clark at 67.3 percent, or about 3 points under its actual registration percentage of the total. Washoe at 19.4 percent, or 2.2 points above its actual reg. Rurals are at 13.3 percent, or .6 percent above their share. 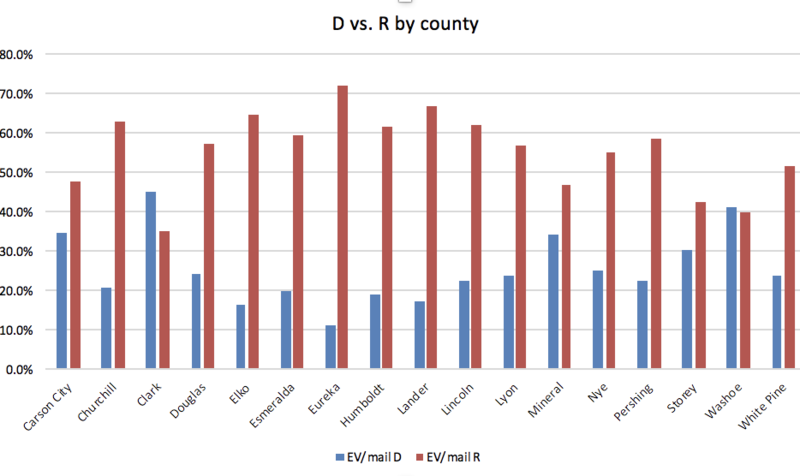 So the rurals are not overperforming in terms of turnout by that much (actual turnout is at 37 percent of all voters there so far), but the margin there (57-24) is more than 3 points better than the actual registration difference between Rs and Ds. So there is hope here for the GOP that there will be a lot of rural votes to turn out Tuesday to get that percentage up — it was up 3.5 points in 2014 and Clark was down 6. Those numbers are nothing close to what this cycle is producing. In Clark, Dems have a 10 point lead, or 3 points under the reg difference. Turnout in Clark is 34 percent. In Washoe, it is less than 1 point for the Dems, or 3 points above the reg difference. Turnout in Washoe is almost 40 percent. Washoe may end up being the key to all with its higher than average turnout and higher than expected Dem advantage. If that translates on Election Day, then the GOP will have to perform even better in the rurals to win those top two races and the Dem firewall in Clark will not have to be quite as high for them to win. So the Republicans have a 2.6 percent advantage, not enough to neutralize the Democratic registration edge. The rurals are keeping them alive in the top two races, and we will know in a few hours just what the numbers are going into Election Day. Welcome to the final day of early voting, which could last to as long as midnight. The Democrats are hoping for a repeat of Day 13 today, when they boosted Clark turnout to its highest total so far (31,400) and added more than 4,000 to the southern firewall. That puts it at 37,500, almost guaranteeing they get to 40,000, which I have said from the beginning would give them some comfort and give Republicans heartburn. It’s not a guarantee of victory, but with Washoe a wash, that would mean there has to have been little cannibalization of the rural vote and a huge Election Day turnout there for the GOP to have a good chance. 2010: Firewall was 25,000, or 9 percent; those tallied ballots showed Harry Reid with a 34,000-vote early vote lead over Sharron Angle, or 12 points. 2012: Firewall was 71,000, or 15 percent; those tallied ballots showed Barack Obama with a 70,000-vote early vote lead over Mitt Romney, or 14 points. Shelley Berkley was ahead of Dean Heller by 50,000 votes, or almost 11 points. You can see why I say that Democratic candidates need to win Clark County by at least 10 points to feel comfortable they can offset what happens in the other 16 counties. Dems holding their own in Washoe leaves GOP candidates less margin for error and puts a lot of pressure on the rurals on Election Day. Let’s see what happens today, but a 40,000-ballot firewall would be about 10 percent of the early/mail vote in Clark. Will it be enough? Dem statewide lead is 15,000 — probably be about 14,500 after all Thursday votes counted — or 2.7 percent. That’s not huge, but it means that indies need to be breaking for the GOP by double digits or there must be severe Dem base bleeding for Dean Heller and Adam Laxalt to win. It’s possible, but as that firewall grows, the margin for error diminishes. If the Dems do today in Clark what they have done in the last four cycles — have their best showing of the fortnight — that means the statewide lead will go up by two or three thousand voters. So Election Day turnout — usually only 30 percent in a midterm, but conceivably higher in this one — is still the known unknown. Are there fine old cannibals voting in the rurals (If you don’t know the reference, I’m sorry.) who usually would have voted on Election Day, and are younger, minority voters going to continue to surge today and Tuesday? If so, the small wave becomes big. If not, it will be a long night. CD3 (Danny Tarkanian vs. Susie Lee): Dems +2,900 (1.7 percent), Dems gained significantly. Not quite Lean D yet, but getting there. CD4 (Steven Horsford vs. Cresent Hardy): Dems +14,000 (12 percent) in the Clark part, which is more than 80 percent of the district. Hardy needs a rural miracle. —SUPERMAJORITY WATCH (Dems need to sweep the three competitive state Senate races and net one in Assembly): Dems are going to win a state Senate seat (Becky Harris’s), and the GOP is poised to pick up only one Assembly seat but could lose two others. SD8 (Republican Valerie Weber vs. Democrat Marilyn Dondero Loop)— Dems+250. Small Dem gain. Toss-up, but Dem lead starting to grow. SD9 (Republican Tiffany Jones vs. Democrat Melanie Scheible) — +2,500 Dems. Say hello to Sen. Scheible. SD20 (Republican Keith Pickard vs. Democrat Julie Pazina) — +350 Dems, slight D gain. Slight lean D.
Remember these are all GOP-held and all open seats (Patty Farley was elected as one, at least), and if the Dems take them all, they have a supermajority. They are all but assured of getting to 12, and if those numbers continue to grow in SD20, it will be at least 13. In the key Assembly districts, the GOP is favored for one Washoe pickup to get to 16 seats but two of their Clark seats look increasingly in jeopardy and the Dems all look safe from these numbers. The Dems only need to net one to get to a supermajority. AD2 (Republican John Hambrick* vs. Democrat Jennie Sherwood)— GOP +350, no change. Likely R.
AD4 (Republican Richard McArthur* vs. Democrat Connie Munk) — GOP +100, About the same. Rs starting to sweat this one, moving to toss-up. AD21 (Republican Cherlyn Arrington vs. Democrat Ozzie Fumo*)— Dems +1,000, Ds gained. Likely D.
AD22 (Republican Melissa Hardy vs. Democrat Kristee Watson) — GOP +500, Rs gain. Likely R.
AD29 (Republican Stephen Silberkraus vs. Democrat Lesley Cohen*) — Dems +900, same. Likely D.
AD35 (Republican David Schoen vs. Democrat Michelle Gorelow and indie Daniel Hofstein) — Dems +1,200, D gain. Likely D.
AD37 (Republican Jim Marchant* vs. Democrat Shea Backus) — About even. Toss-up. AD41 (Republican Paris Wade vs. Democrat Sandra Jauregui*) — Dem +900,D gain. Likely D.
It’s all about Republicans Jim Marchant and Richard McArthur, who could lose and give the Dems a supermajority. The rest are all but over unless there are very strange down-ballot voting patterns. I suppose it’s possible, but I am sure Dems are hopeful, and Republicans are triaging Marchant and McArthur. More later with updated models and numbers…. Big day in Clark for Dems as 31,000 turnout yields a more than 4,000 ballot edge — southern firewall now at 37,500-plus. Rurals subtracted at least 1,000 ballots from that already and probably will take a little more — but population matters and Dems are likely to have a 10-point lead in Clark by Friday evening. In Washoe, Dems picked up a few votes, lead by just under 700. All Dems wanted there was a draw, and they are going to get one even if GOP has a good day Friday. If Dems have a similarly big day Friday, tremendous pressure on Republicans to have big Election Day. Blog ya in the AM, people…. So Ds are about 3.5 points under registration, Repubs are almost 4 points above theirs and indies are about 5.5 points below theirs. I repeat: This is why the Democrats strive to establish a registration edge because they know GOP turnout will be higher. The question is how much higher. They don’t want the edge to grow much larger than it is right now. 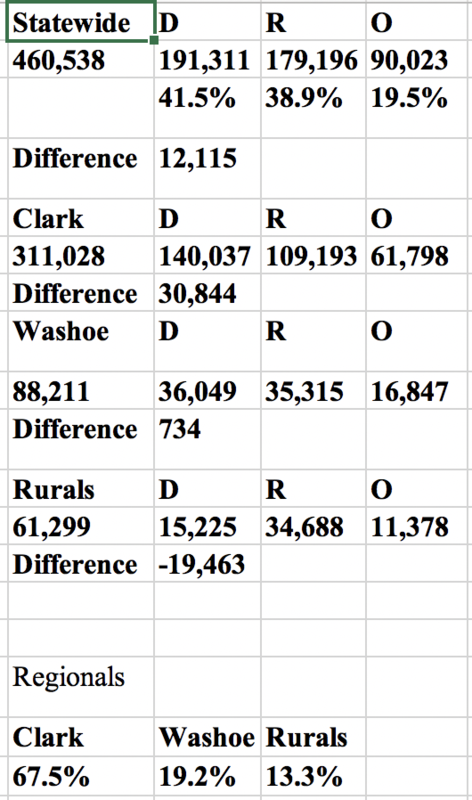 So Clark is nearly 3 points lower than its reg, Washoe is up 2 points and the rurals are up less than a point. This, too, always happens in midterms, but was especially disastrous in 2014 when Clark was down 6 points and the rurals were up 3.5 points. That will not happen this cycle. But the question remains: What will Election Day look like? Will Clark’s share go up or down? Have the rurals reached their peak with all of these votes and absentees, or can they do as well as they usually do on Election Day? And will the Washoe turnout, which favors Democrats, be the decider? —Turnout in Clark was at 17,300 at 3 PM, so it’s unlikely to get much more than 25,000 today. That would break a trend from the last four cycles in which the last two days were the largest days in Clark. The Dems really wanted to make a good showing on Day One this year after the 2014 debacle and 30,000-plus turned out. Is it possible they are cannibalizing some of the Clark vote? The Dems were going to need big margins the last two days to get to a 40,000-ballot cushion. It may be too steep a hill to climb if turnout doesn’t get much past 25,000 today. This has a degree of sameness the last few days, with Democrats maintaining a small ballot and percentage lead statewide as the Clark firewall slowly grows and the rurals offset to a degree. But one point to remember: Even as the percentage lead for the Dems has stayed constant or gone down a little, the raw ballot leads in some of the models have inched up. And there will be fewer votes to make up any disadvantages on Election Day, which is a significant hurdle for any Republicans who are behind. —-How are indies voting: Is it like 2016 when they went by small double digits to the top GOP candidates? Or will they lean toward the party out of power, as they are in some polling, because of the president? See the models below for what the impact could be. —-How many votes will be left after Friday? There weren’t enough left after early/mail voting in 2010 to save Sharron Angle, in 2014 to save any Democrats and in 2016 to save most Republicans. But two years ago, the Dems needed a 70,000-plus firewall to survive an Election Day onslaught, which Hillary and Catherine Cortez Masto did. I still think most 2016 comparisons are invalid despite the high turnout. But partisans will be partisan, so some Republicans are hoping the comparison is valid. The question distilled is simple: Will a 3 percent or so ballot lead, with bases holding and no huge advantage either way, be enough for Democrats to hold on? —If Dean Heller and Jacky Rosen are holding 90 percent of their bases and getting 5 percent of the other’s and each is getting 45 percent of indies: Rosen is ahead by 10,700 votes, or 2.1 percent..
—If they are at 90-5 with the bases and Heller is ahead by 50-45 with indies: He is losing by almost 6,000 votes, or 1.2 percent. —If they are at 90-5 with the bases and Rosen is ahead by 50-45 with indies: She is ahead by almost 16,000 votes, or 3.1 percent. —If they are at 90-5 with the bases and Heller is ahead by 50-40 with indies: He is losing by 800 votes, or .2 percent. —If they are at 90-5 with the bases and Rosen is ahead by 50-40 with indies: She is ahead by almost 22,000 votes, or 4.1 percent. In the governor’s race, we still don’t know what the Ryan Bundy factor is and how much, if at all, he will hurt Adam Laxalt. He has been at as much as 6 percent in some polls. But say he is getting half of that right now. That would mean he has more than 15,000 votes already. Think about that. CD3 (Danny Tarkanian vs. Susie Lee): Dems +2,300 (1.5 percent), Dems gained a little. Tark is still in it. CD4 (Steven Horsford vs. Cresent Hardy): Dems +12,000 (11.2 percent) in the Clark part, which is more than 80 percent of the district. I don’t see how Election Day saves Hardy. —The legislative numbers in the key districts – Dems are going to pick up a state Senate seat (Becky Harris’s), and the GOP is poised to pick up only one Assembly seat but could lose others. SD8 (Republican Valerie Weber vs. Democrat Marilyn Dondero Loop)— Dems+200. Small Dem gain. Toss-up. SD9 (Republican Tiffany Jones vs. Democrat Melanie Scheible) — +2,200 Dems. Keeps going up. This is gone for GOP. SD20 (Republican Keith Pickard vs. Democrat Julie Pazina) — +300 Dems, GOP shaved 100 off lead Wednesday. Slight lean D.
Remember these are all GOP-held and all open seats (Patty Farley was elected as one, at least), and if the Dems take them all, they have a supermajority. They look almost assured of getting to 12, and if those numbers continue to grow in SD20, it will be at least 13. In the key Assembly districts, it still looks like GOP favored for one pickup to get to 16 seats but two of their seats look increasingly in jeopardy and the Dems all look safe from these numbers. The Dems only need to net one to get to a supermajority. AD2 (Republican John Hambrick* vs. Democrat Jennie Sherwood)— GOP +350, Ds gain. Likely R.
AD21 (Republican Cherlyn Arrington vs. Democrat Ozzie Fumo*)— Dems +825, Ds gained. Likely D.
AD22 (Republican Melissa Hardy vs. Democrat Kristee Watson) — GOP +400, Rs gain. Likely R.
AD29 (Republican Stephen Silberkraus vs. Democrat Lesley Cohen*) — Dems +900, slight gain. Likely D.
AD35 (Republican David Schoen vs. Democrat Michelle Gorelow and indie Daniel Hofstein) — Dems +1,000, small D gain. Likely D.
AD37 (Republican Jim Marchant* vs. Democrat Shea Backus) — About even, D gain. Toss-up. AD41 (Republican Paris Wade vs. Democrat Sandra Jauregui*) — Dem +800,D gain. Likely D.
—-Nearly half a million people have voted. That’s about a third of active voters. I still think we get to 600,000 or so by the end of the day Friday, which means that Election Day turnout could bring the total up to at least 900,000 or even 1 million. I will start doing extrapolations for various Nov. 6 scenarios soon. Will it be 40 percent, as in traditional midterms, or 30 percent, as in a presidential year? Hard to tell because this is NOT a normal year. —After Lyon reports, the Dems will have a lead of slightly under 13,000 votes statewide, or about 2.6 percent. That percentage has been shrinking by a tenth of a percent daily for a few days, thanks to the rurals. If the Dems can get to 3 percent by the end of the day tomorrow, that would take a big GOP Election Day to overcome. If the GOP can move that number under 2.5 percent by the end of the day Friday, it might take less of an effort on Nov. 6 for their statewide candidates to win. Caveats: We don’t know how indies are breaking. If they are breaking for the GOP, they need less of an effort on Nov. 6; if they are breaking for the Dems, it will take a huge day. And if either party is losing more than 10 percent off their bases, that’s going to have an impact, too. Who is more likely to cross over this year? Are there more Heller-Sisolak voters or Rosen-Laxalt voters? My guess is the former, but I doubt it’s a huge number. —-Reminder of Wednesday numbers for you lazy non-scrollers: Dems by 2,300 in Clark (have not seen absentee numbers yet), GOP by 60 votes or so in Washoe and the usual rural landslides so far. Clark firewall at 33,000, so 40,000 will be difficult but possible if two big days. The Dems are going to do no worse than a wash in Washoe, which has to make the GOP nervous. And the rural lead is going to be 25,000 or so for the GOP by the end of early voting. I’ll have the models and Clark deep dive and more later, fellow ravenous data-eaters…..
Mini-update: Washoe’s site is not updated, but apparently reported results to SOS, which shows Wednesday was essentially a draw when early and absentee ballots are counted. Dems lost about 60 votes off their lead, still have almost a 700-vote cushion. Dems won Clark by 10 percentage points, adding 2,300 to total, pushing ballot lead to about 33,000 (no absentees until AM). So 35,000 is a lock, 40,000 would require an average of 3,500 added Thursday and Friday. Unlikely. Washoe is a mess. County uploaded a data file and labeled it 10/31, but with no totals listed on the site. At first I didn’t notice after downloading that it was actually labeled 10/30 on the Excel file, which is an odd error. No numbers yet, so may have to sleep not knowing the Wednesday outcome. 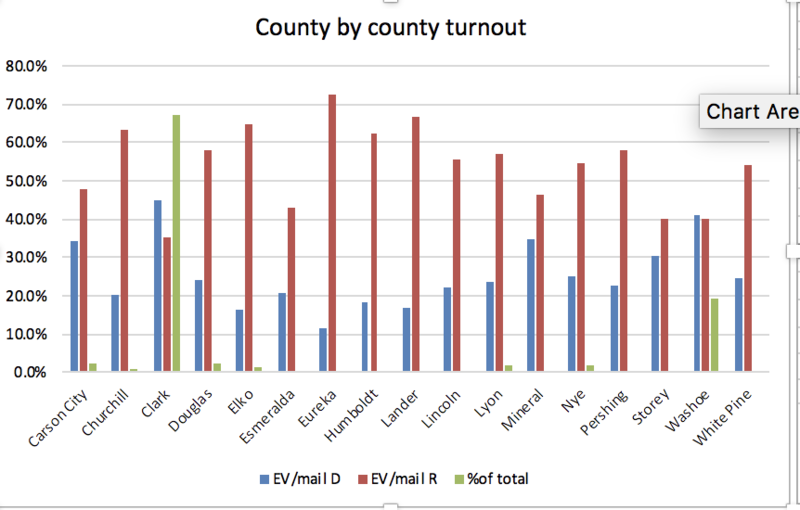 I have updated the chart on county by county turnout, thanks to an excellent suggestion from one of my Twitter followers (Carlos Nai), to show you the percentage every county is bringing to the turnout. After Clark (67 percent) and Washoe (19 per cent), the top six include Carson City (2.5 percent), Douglas (2.5 percent), Lyon (2.1 percent) and Nye (2.1 percent). 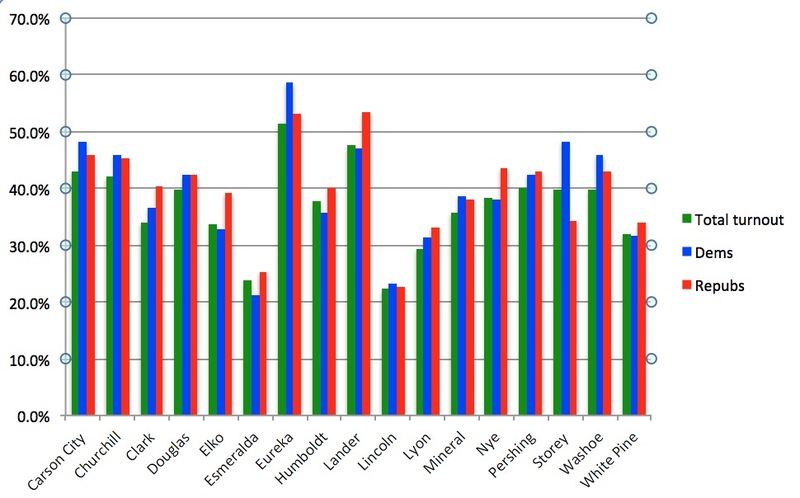 Most of the 15 rurals are barely visible in the chart, but those four and Churchill (1.1 percent) and Elko (1.5 percent) make up almost all of the 20,000-vote lead the Republicans have in the rurals. The rurals have negated the Clark County advantage the last couple of days, allowing the Repubs to gain ground. Lead is only 2.6 percent now; it had been close to 3 percent. The story is coming down to this: Dems probably hope to get to at least a 3 percent statewide lead by the end of the week and then hope to hold their own on Election Day. If the Clark firewall is big enough, there will not be enough rural votes on Election Day to offset them. The Dems surely cannot afford the hemorrhaging (losing 3.5 points) on Election Day as they suffered in 2016. But there were likely many more votes on Election Day two years ago than there will be this cycle. Republicans, if they can keep it to 3 points after early voting and win indies, will still have a reasonable chance on Election Day to win the top two races. —If Dean Heller and Jacky Rosen are holding 90 percent of their bases and getting 5 percent of the other’s and each is getting 45 percent of indies: Rosen is ahead by 10,000 votes, or 2.2 percent..
—If they are at 90-5 with the bases and Heller is ahead by 50-45 with indies: He is losing by 6,000 votes, or almost 1.3 percent. —If they are at 90-5 with the bases and Rosen is ahead by 50-45 with indies: She is ahead by almost 15,000 votes, or 3.2 percent. —If they are at 90-5 with the bases and Heller is ahead by 50-40 with indies: He is losing by 1,300 votes, or .3 percent. —If they are at 90-5 with the bases and Rosen is ahead by 50-40 with indies: She is ahead by 19,000 votes, or 4.2 percent. Bottom line: Heller better be winning among indies, as the 2016 GOP top of the ticket candidates were or he is almost surely behind right now. And that’s assuming he is holding 9 out of 10 Republicans (which is what the CNN poll showed). CD3 (Danny Tarkanian vs. Susie Lee): Dems +2,100 (1.5 percent), GOP gained a little. Tark is still in it. CD4 (Steven Horsford vs. Cresent Hardy): Dems +11,500 (11.5 percent) in the Clark part, which is more than 80 percent of the district. I don’t see how Election Day saves Hardy. —The legislative numbers in the key districts – Dems are going to pick up a state Senate seat (this is Becky Harris’ seat not Patty Farley’s, as I previously said) and the GOP is poised to pick up only one Assembly seat but could lose others. SD8 (Republican Valerie Weber vs. Democrat Marilyn Dondero Loop)— Dems+150, About the same. Toss-up. SD9 (Republican Tiffany Jones vs. Democrat Melanie Scheible) — +1,900, Dems. Same. This one seems impossible for the GOP. SD20 (Republican Keith Pickard vs. Democrat Julie Pazina) — +400 Dems, no change. Starting to lean D a touch. AD2 (Republican John Hambrick* vs. Democrat Jennie Sherwood)— GOP +400, Rs gain. Likely R.
AD4 (Republican Richard McArthur* vs. Democrat Connie Munk) — GOP +125, About the same. Lean R.
AD21 (Republican Cherlyn Arrington vs. Democrat Ozzie Fumo*)— Dems +800, Ds gained. Likely D.
AD22 (Republican Melissa Hardy vs. Democrat Kristee Watson) — GOP +300, Rs gain. Lean R.
AD29 (Republican Stephen Silberkraus vs. Democrat Lesley Cohen*) — Dems +775, slight gain. Likely D.
AD31 (Jill Dickman vs. Skip Daly*) — GOP +550, big gain. Strong lean R.
AD35 (Republican David Schoen vs. Democrat Michelle Gorelow and indie Daniel Hofstein) — Dems +950, big D gain. Likely D.
AD37 (Republican Jim Marchant* vs. Democrat Shea Backus) — GOP +40, D gain. Toss-up. AD41 (Republican Paris Wade vs. Democrat Sandra Jauregui*) — Dem +700,D gain. Likely D.
By the time those outstanding rurals are counted, about 460,000 people will have voted, or just under 30 percent of active voters. The Democrats will have a statewide lead of a little more than 12,000 votes, or steady at 2.7 percent. Will that be enough for Steve Sisolak and Jacky Rosen? Or can Election Day save Adam Laxalt and Dean Heller? Here’s what both sides have to be thinking: It’s going to be close. I still think the Democrats have to like their position slightly more than the Republicans because of that lead and because they think they can do well on Election Day with the GOP is using up more of its inveterate voters during the early voting fortnight. But I assure you they are not confident. This may be three-quarters of 2016 in terms of turnout, but it is not a presidential year where the Democrats — as they did in 2012 and 2008, actually — built up firewalls in the South that all but predetermined which presidential nominee would win the state. They will have a firewall — at least 35,000 and as much as 40,000 — but it will not be as large as a presidential year. Consider: Those huge leads in Clark in 2012 and 2016 assured Barack Obama (6.5 points) and Hillary Clinton (2.5 points) of wins before Election Day. Clinton’s margin was diminished after a strong Election Day by the GOP, but it was too little, too late. Those were presidential races at the top of the ticket, with the nominees driving turnout. A midterm with the president only on the ballot by proxy is different, but how different it will be this cycle — turnout is way up over 2014 and above 2010 — is an open question. Remember: We have not had super-close races for governor AND Senate at the top in any of the last few cycles. How does that affect the turnout and composition of the electorate? In 2010, Harry Reid won despite a smaller firewall, although 9 percent is nothing to sneeze at. And people forget he won pretty easily — nearly 6 points. In 2012, Dean Heller won by 1 percent despite that huge early vote firewall, which proved illusory because Shelley Berkley could not hold it after that House Ethics probe albatross. He was an outlier, though, as he has been his entire career, defying the odds and never losing. In 2014, there was no firewall for the Dems and they lost….just about everything. So there is no clear algorithm the last four cycles except that the Clark firewall has to be pretty large. Right now, it is about 10 percent, slightly larger than Harry Reid had when he survived, and it could get bigger. As I have told you, if a Democrat has a 10 percent lead in Clark County, it is almost impossible for a GOP candidate to survive statewide, unless Washoe really helps (Heller won by 20,000 votes there in 2012 but the Dems are turning out well this cycle) and the rural landslide is big enough, which is a difficult needle to thread. This is why the Democrats have a built-in advantage with early voting, especially with the reg edge they have enjoyed the last few cycles. And it has been enough for the top of the ticket every cycle of the last four, with Heller bucking the blue wave of 2012. Can he survive again? It’s certainly possible, but Rosen has proven a tougher target than Berkley. Heller has bet it all on Trump and the president juicing GOP turnout, and it may work. Watch the next three days and that firewall. I’ll update the models when the rurals come in and have the Clark deep dive later today…. Lay of the land: Clark firewall approaching 31,000 after today as Dems won by 2,400 (almost 9 points). Dems barely won Washoe in early votes and lost it by a little after absentees counted, still lead by 700 or so. Rurals coming in, turnout tailing off slightly, but Rs will still pick up hundreds of votes. Bottom line: If past cycle’s turnout patterns hold, Dems will only do better on the last three days in Clark, should get to 35,000, perhaps 40,000. If they get to 40,000, and continue to hold their own in Washoe, the rural landslide will not be enough to save statewides unless Dems are losing more than normal off their bases and losing indies by double digits. There is little margin for error in a rurals vs. urban strategy, but that is what Team GOP went for this cycle. It still could be close. One other aspect of these consistent Clark wins, as you have seen and I will detail again Wednesday, is the impact on down-ballot races. CD4 appears to be done for the Dems, as does Senate District 9, a key swing. The GOP is not going to pick up any Assembly seats in the South (they look likely to pick off Skip Daly in the North) and a handful of their incumbents are at risk, especially if the Dems surge in the next three days in Clark. Less than a week to go…. —-All data in for Monday and Lyon County came back with a big day, and the statewide Dem lead is down to 11, 200. That’s 2.7 percent, but GOP wins the day Monday. —-Today is a pivotal day in the final week, if past is prologue. Repubs are primed to do well in Clark before the expected late-week Dem surge. Can the Dems continue to keep it close in Washoe? 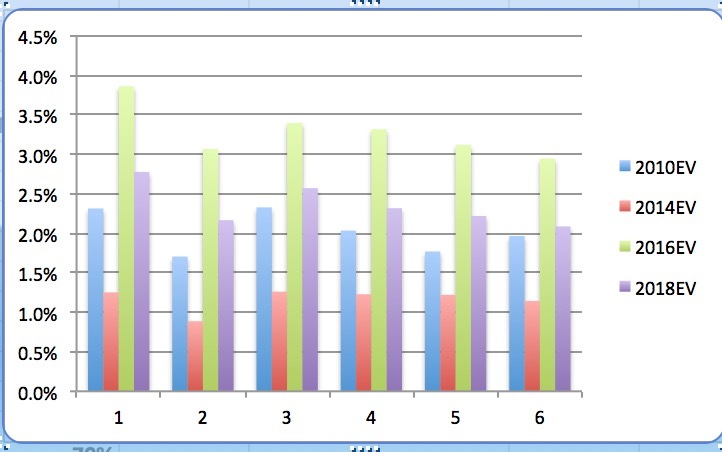 And after the Dems neutralized the GOP absentee ballot campaign in Clark, can the rurals keep up this landslide pace? Numbers in a few hours…..
—If Dean Heller and Jacky Rosen are holding 90 percent of their bases and getting 5 percent of the other’s and each is getting 45 percent of indies: Rosen is ahead by 10,000 votes, or 2.5 percent..
—If they are at 90-5 with the bases and Heller is ahead by 50-45 with indies: He is losing by 6,000 votes, or almost 1.5 percent. —If they are at 90-5 with the bases and Rosen is ahead by 50-45 with indies: She is ahead by almost 14,000 votes, or 3.5 percent. —If they are at 90-5 with the bases and Heller is ahead by 50-40 with indies: He is losing by 2,000 votes, or half a percent. —If they are at 90-5 with the bases and Rosen is ahead by 50-40 with indies: She is ahead by 18,000 votes, or 4.3 percent. The rurals coming back online Monday (they were closed Sunday) helped keep the models at status quo. But you still see the challenge Heller has if he can’t hold his base and does not win indies. CD3 (Danny Tarkanian vs. Susie Lee): Dems +2,200, about the same. Not a huge ballot lead (under 2 percent) with all those indies, but if it continues to grow, Tark is in trouble. CD4 (Steven Horsford vs. Cresent Hardy): Dems +10,300 (11 percent) in the Clark part, which is more than 80 percent of the district. This is almost gone for the GOP, if it isn’t already. SD8 (Republican Valerie Weber vs. Democrat Marilyn Dondero Loop)— Dems+150, Dems gained. Toss-up. SD9 (Republican Tiffany Jones vs. Democrat Melanie Scheible) — +1,900, Dems. Dems gained ground. This one seems impossible for the GOP. SD20 (Republican Keith Pickard vs. Democrat Julie Pazina) — +400 Dems, gained some ground. Starting to lean D a touch. AD2 (Republican John Hambrick* vs. Democrat Jennie Sherwood)— GOP +350, about the same. Likely R.
AD4 (Republican Richard McArthur* vs. Democrat Connie Munk) — GOP +150, About the same. Lean R.
AD21 (Republican Cherlyn Arrington vs. Democrat Ozzie Fumo*)— Dems +750, Ds gained. Strong lean D.
AD22 (Republican Melissa Hardy vs. Democrat Christee Watson) — GOP +200, About the same. Lean R.
AD29 (Republican Stephen Silberkraus vs. Democrat Lesley Cohen*) — Dems +750, gained ground. Strong lean D.
AD31 (Jill Dickman vs. Skip Daly*) — GOP +400. Lean R.
AD35 (Republican David Schoen vs. Democrat Michelle Gorelow and indie Daniel Hofstein) — Dems +850, big D gain. Strong lean D.
AD37 (Republican Jim Marchant* vs. Democrat Shea Backus) — GOP +150, About the same .Slight lean R.
AD41 (Republican Paris Wade vs. Democrat Sandra Jauregui*) — Dem +600, about the same. Strong lean D.
The Rs have very little chance for pickups, it would seem, except AD31, which is a good bet for them. But they still need to turn the tide to stop from losing any seats in Clark, and they lost ground Monday. The Clark turnout maps for comparison (still about three-quarters of 2016 and above where 2010 was, so some hyrbrid of those two years is what this is). SOS did update (first week of numbers is here so you don’t have to scroll down) and Clark absentees added: Dems have 600-ballot lead, adding 500 or so to firewall and statewide lead, now at 28,500 and 12,500, probably, after rurals added. Day 10 in the books. Not a huge change after Monday, with Republicans doing slightly better in Clark but still a decisive loss. The Democrats in their southern stronghold usually are weakest in Days 10 and 11. GOP gained in Washoe, still down by 800 votes. Some of the rurals are not in yet , so subtract a few hundred votes from the Dems’ statewide lead and say it is now 12,000 out of 411,000 cast. That’s just under a 3 percent lead. —-28,000: That’s the Democratic firewall in Clark County. It will get to 35,000 unless something very strange happens, which is the minimum I think the Dems would want to have a chance in major statewide races, and it could get to 40,000, which will make the GOP nervous. 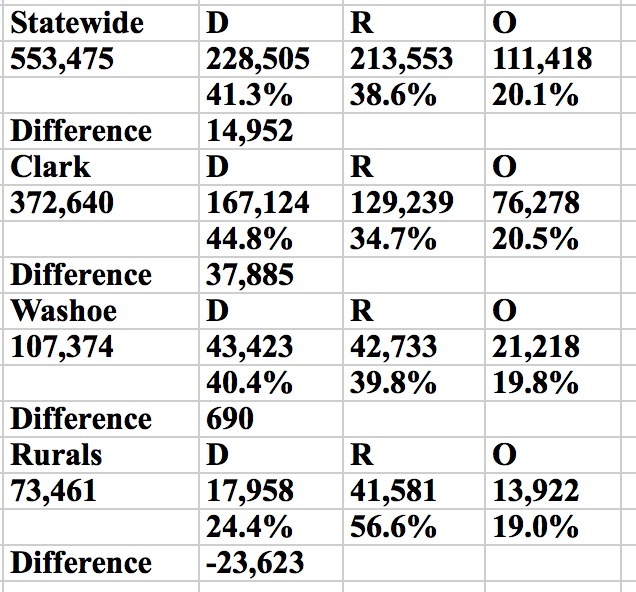 The reason the Clark firewall number is always the main one to watch is because if it gets large enough and Democratic straight-ticket voting is robust enough, the rural and Washoe numbers don’t matter as much. —-17,000: That will be the GOP lead in rural Nevada (after they are all counted), not enough to offset the Clark number, which should grow faster than the rural count. (The GOP is winning the rurals by 31.5 points — their actual advantage is 29 points.) 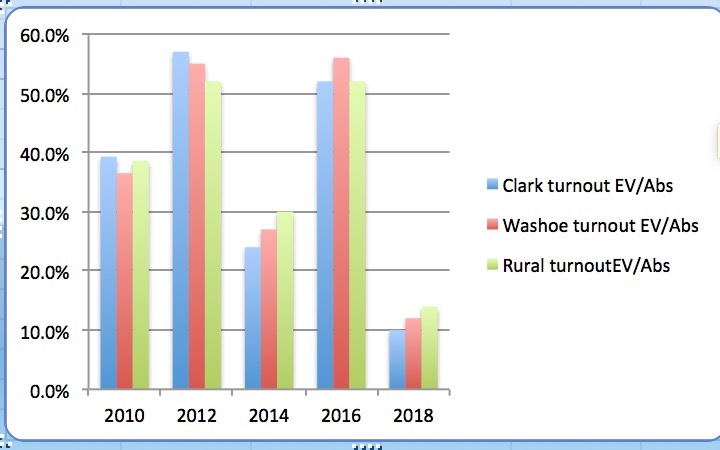 And that brings us to Washoe: The reason the Democrats holding it close there is so critical (and they are slightly ahead now) is that it makes it a battle between Clark and the rurals, and only in 2014 was that enough to cause the red wave because of extraordinarily low Clark and Dem turnout. That is not happening this time. —-26.5 percent: That’s the statewide turnout so far. 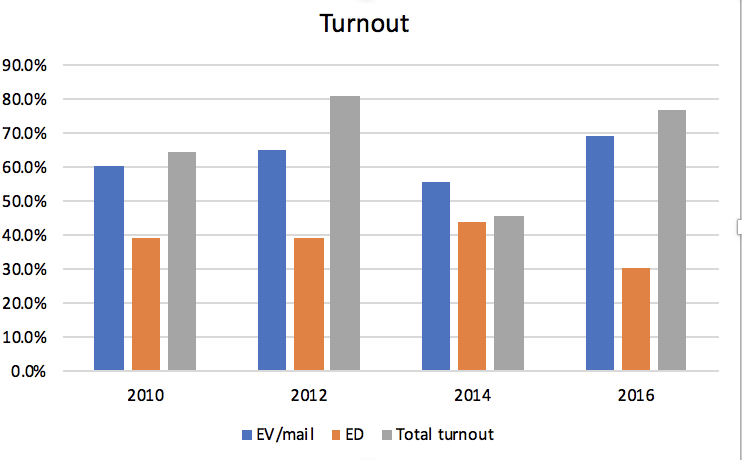 If the usual second-week surge occurs, that means total early/mail turnout could be 40 percent of active voters, or 600,000. And that means my higher estimate of 1 million total voters, or 60 percent, seems likely. We still don’t know if Election Day will be higher or lower than usual. If it’s lower, turnout could be closer to 900,000. But, again, this is why Dems try to bank so many votes before Election Day because they usually lose on Election Day. 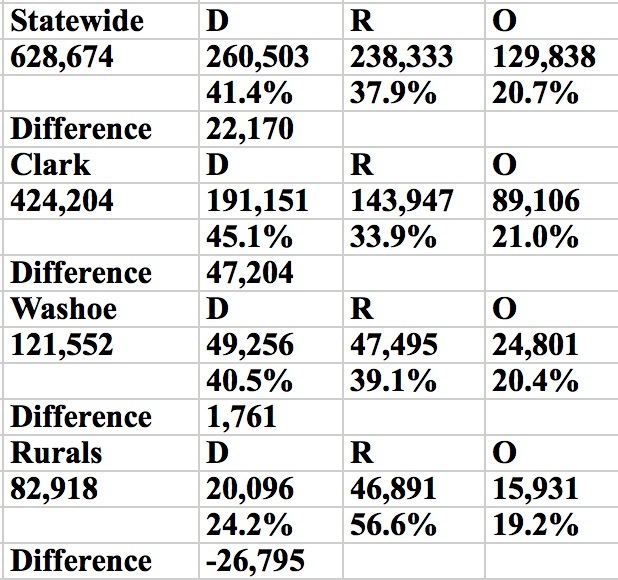 —-29.5 percent: That’s the Washoe turnout number, higher than rurals (26.2 percent, and it will get a bit higher after the stragglers report)) and Clark (25.6 percent). And Democrats are unusually energized and mobilized in a county where the GOP leads 37-35. The Dems are 6 points above registration and the GOP is 3 points above. 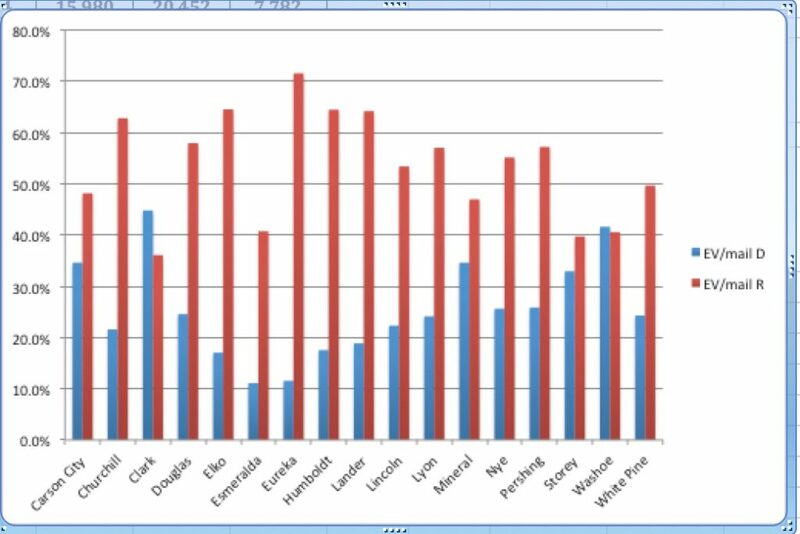 —-70-17-13: Those are the actual Clark-Washoe-rurals registration percentages of the statewide reg total. The current early/email numbers: 68-19-13. So Clark down 2, Washoe up 2 and the rurals are at registration. That’s good news for the Dems, too, but it could change after Election Day. Let’s see if the mix is changing — the first week showed more reliable GOP voters casting ballots, suggesting some possible Nov. 6 cannibalization. —-80,000: That’s how many non-major-party voters have cast ballots. That’s 19.3 percent. How are they voting? They could still be the deciders. —-2016: People keep making the comparison to the last cycle, which I still say is not instructive. Even though this is a high-turnout midterm, it will look much more like 2010 than 2016. The firewall, the turnout patterns are not comparable to a presidential cycle. What we know for sure is it is not 2014, when the Republicans won Clark in early voting and swept the state. I’ll update the models later…. Dems won Clark by 2,400 votes, southern firewall at 28,000 or so (absentees not in.) Not as big as double-digit weekend wins, but solid 9-point victory for Dems. 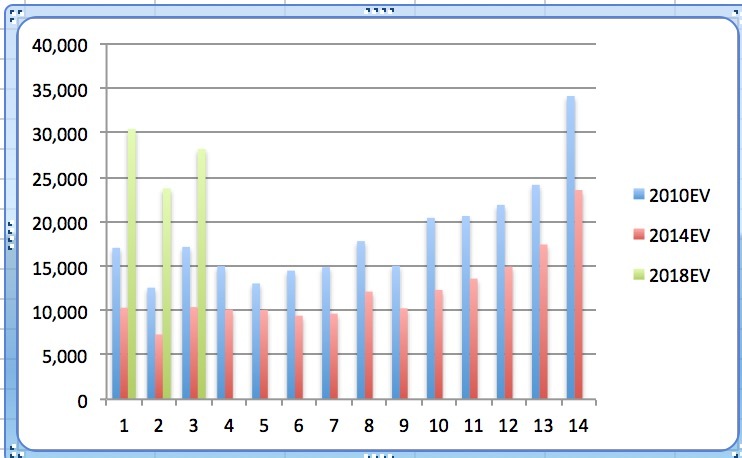 Follows past cycles’ pattern of GOP doing better on Monday and Tuesday of second week. Dems should get to 35K lead in Clark by end of the week. If they don’t, then the pattern of Dems surging at the end of the second week will have changed. GOP won Washoe early vote for second time in 10 days, by only 32 votes. But absentees went to Repubs my more than 250, so clear win. Dems now up in Washoe by about 800. Rurals trickling in — the Repubs are going to pick up hundreds of votes there. My guess is, after all rurals in, Dems will have a victory statewide Monday but not a huge one. Ballot lead, which was 11,000-plus, won’t change a lot. Bottom line: Dems still doing well for a midterm, but the major races are far from decided. Here are the updated models and Clark deep dive — note that right now, unless GOP statewide contenders are getting a lot of crossover votes and a significant percentage of indies, they are behind. And it is much more likely, based on national trends, that neither of those things is happening. Election Day will matter, as will the final five days this week, but the early vote/mail models are starting to tilt toward the Dems. —If they are at 90-5 with the bases and Rosen is ahead by 50-45 with indies: She is ahead by almost 13,000 votes, or 3.5 percent. —If they are at 90-5 with the bases and Heller is ahead by 50-40 with indies: He is losing by 2,500 votes, or half a percent. —If they are at 90-5 with the bases and Rosen is ahead by 50-40 with indies: She is ahead by 17,000 votes, or 4.5 percent. Those numbers will rise or fall with the performance of the parties the last five days. So you see the imperative for the Repubs to do well or those potential leads will grow. CD3 (Danny Tarkanian vs. Susie Lee): Dems +2,200, substantial gains Sunday. Not a huge ballot lead with all those indies, but if it continues to grow, Tark is in trouble. CD4 (Steven Horsford vs. Cresent Hardy): Dems +9,000 in the Clark part, which is more than 80 percent of the district. If this keeps going, the rurals can’t save Hardy this time. SD8 (Republican Valerie Weber vs. Democrat Marilyn Dondero Loop)— Still about even despite big D weekend. Toss-up. SD9 (Republican Tiffany Jones vs. Democrat Melanie Scheible) — +1,750, Dems. Dems gained ground. This one still looks lost to the GOP. SD20 (Republican Keith Pickard vs. Democrat Julie Pazina) — +375 Dems, gained some ground. Toss-up, but may be lean D soon if this continues. AD4 (Republican Richard McArthur* vs. Democrat Connie Munk) — GOP +150, Dems gained a tad. Lean R.
AD21 (Republican Cherlyn Arrington vs. Democrat Ozzie Fumo*)— Dems +700, Ds gained. Strong lean D.
AD22 (Republican Melissa Hardy vs. Democrat Christee Watson) — GOP +200, Dems gained a little. Lean R.
AD29 (Republican Stephen Silberkraus vs. Democrat Lesley Cohen*) — Dems +600, gained ground. Strong lean D.
AD35 (Republican David Schoen vs. Democrat Michelle Gorelow and indie Daniel Hofstein) — Dems +800, big D gain. Strong lean D.
AD37 (Republican Jim Marchant* vs. Democrat Shea Backus) — GOP +150, Dems gained.Slight lean R.
AD41 (Republican Paris Wade vs. Democrat Sandra Jauregui*) — Dem +600, gaining ground. Strong lean D.
The Rs lost ground in almost every race. The GOP still looksx likely to pick up that Washoe seat (Dickman), but they need to turn the tide to stop from losing any seats in Clark. Next few days are critical. Welcome to the last five days of early voting — and these 14 days of pre-election balloting will be 60-70 percent of the total vote in Nevada. The lead in Clark County is now about 25,000. So a 35,000-vote firewall to offset rural losses is reasonable, although today and Tuesday are traditionally the best days for the GOP in Clark of the two-week period. The robust Washoe numbers for the Dems — they have won eight of nine days and have a 1,000-vote lead there — also could help mitigate rural bleeding. Dems had second straight day of a 16 percentage point win in Clark (their reg advantage is 13), adding 3,400 votes to their southern firewall, which is now at about 25,000. Rural were closed today, so Dems built up their lead by winning both urban counties. The Republicans traditionally rebound in the first part of the second week — yes, this pattern exists — and have their best days on Monday and Tuesday. So if they are going to break the recent Dem surge, look for it to happen Monday and Tuesday. Democrats generally have their best days toward the end of the second week, finishing progressively better in the last three days. 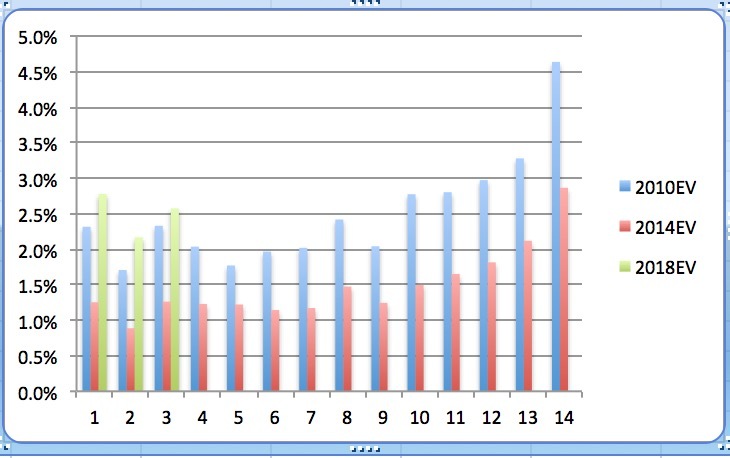 Turnout has been significantly higher in the second week in recent cycles. Will this cycle be different? We shall see. By the way, the firewall at the end of early voting when Harry Reid was saved by his machine in 2010: 25,000. There were 400,000 fewer registered voters in Clark eight years ago, so a comparable number this cycle would be about 35,000. In 2014: The GOP had a 250-ballot edge in Clark at the end of two weeks, presaging the red wave. All of these may be apples to oranges, but it’s clear that the GOP needs the pattern of a turnaround the next couple of days to repeat itself or the Democrats will likely get close to a 40,000-ballot advantage in Clark. Considering the early vote will be about 60 percent of all votes cast and maybe higher, that will be a formidable advantage. And, yes, if you are wondering, early vote numbers almost always reflect high partisan voting patterns that are revealed when they are posted on Election Night. More tomorrow, fellow data geeks…..
Dems won Washoe again, eight days out of nine, by 232 votes, or 6 percent — 1,704-1,472. Washoe lead for Dems is now more than 1,000. Remember Washoe reg is 37-35, Rs. Dems just want to stay close there, win Clark big and not get wiped out in rurals. Repubs want to win there by a decent margin and by ultra-landslides in the rurals to make up for losing Clark, where two-thirds of the votes are. One other note: A lot of people have talked about plugging the early numbers into the Senate race NYT poll . So I did through yesterday. If you use the party reg breakdowns (87-6, Dems hold base; 87-5, GOP holds base; indies breaking 49-40 for Heller), here’s what you get: Heller is ahead by 1,000 votes, or .3 percent. That is….tight. Cautionary note, though: The NYT poll imagined a universe of 736,000 voters, and it’s going to be much larger than that. And it has the party reg breakdown at 40-39, D. It’s about 2 points difference now, not 1 point, although it may well end up at 1. Some models to look at with updated numbers — and you can see how the Dems have improved their positions over the last few days. I am using the Senate race as the baseline here but this applies to other statewides as well, and Adam Laxalt is likely in worse shape vis a vis Steve Sisolak — that is, he has less margin for slippage — because of The Bundy Factor, depending on the breakdowns and base-holding. —If Heller and Rosen are holding 90 percent of their bases and getting 5 percent of the other’s and each are getting 45 percent of indies: Rosen is ahead by 6,600 votes, or 2 percent..
—If they are at 90-5 with the bases and Heller is ahead by 50-45 with indies: He is losing by 3,300 votes, or 1 percent. —If they are at 90-5 with the bases and Rosen is ahead by 50-45 with indies: She is ahead by almost 10,000 votes, or 3 percent. —If they are at 90-5 with the bases and Heller is ahead by 50-40 with indies: He is ahead by…..3 votes. —If they are at 90-5 with the bases and Rosen is ahead by 50-40 with indies: She is ahead by 13,000 votes, or 4 percent. So if the pattern continues, Heller and GOP candidates need to do what Donald Trump and Joe Heck did in 2016: Win indies by a decent margin. That seems less likely this cycle, but we have miles to go before we count all the votes (the rest of the second week of early voting and the mystery of who will win Election Day, when only 30-40 percent of the votes will be cast). Saturday was a big day for the Dems in Nevada — 4,000-ballot gain in Clark, 250 in Washoe and rural turnout was down, probably because many of the sites closed early (and I believe they are closed today). All but a few of the smaller rurals are in. Dems added about 3,200 to their statewide lead, so it stands at just under 8,000, above 2 percent. Total votes cast: About 350,000, or about 23 percent. I still think 900,000 (60 percent) is assured for overall total, perhaps 1 million voters (67 percent). The Clark firewall is actually at 22,000 and Dems now have the lead in absentees. I said 40,000 is unlikely, but if the trend continues, it’s not impossible. Maybe it’s a weekend aberration in the data. Maybe recent events — the would-be mail bomber, the synagogue shooter — have changed the electoral dynamic. We will know soon. By the way, turnout always dips on Sunday — and the second Sunday is usually the lowest of any day in the 14. We will see how the parties do. The GOP also does better during the early part of the week and then Dems surge at the end in Clark. But this year is a different year, so…. CD3 (Danny Tarkanian vs. Susie Lee): Dems +1,300, substantial gains Saturday. Not a huge ballot lead with all those indies, but if it continues to grow, Tark is in trouble. Still looks close. CD4 (Steven Horsford vs. Cresent Hardy): Dems +7,500 in the Clark part, which is more than 80 percent of the district. Is this slipping away for Cresent Hardy? SD8 (Republican Valerie Weber vs. Democrat Marilyn Dondero Loop)— Still about even respite big D day. Toss-up. SD9 (Republican Tiffany Jones vs. Democrat Melanie Scheible) — +1,500, Dems. Dems gained ground. This one looks lost to the GOP. SD20 (Republican Keith Pickard vs. Democrat Julie Pazina) — +250 Dems, gained some ground. Toss-up, but may be lean D soon if this continues. AD2 (Republican John Hambrick* vs. Democrat Jennie Sherwood)— GOP +350, Gained a little. Likely R.
AD4 (Republican Richard McArthur* vs. Democrat Connie Munk) — GOP +170, Dems gained a tad. Lean R.
AD21 (Republican Cherlyn Arrington vs. Democrat Ozzie Fumo*)— Dems +500, Ds gained a little. Strong lean D.
AD22 (Republican Melissa Hardy vs. Democrat Christee Watson) — GOP +250, Dems gained a little. Lean R.
AD29 (Republican Stephen Silberkraus vs. Democrat Lesley Cohen*) — Dems +550, gained ground. Strong lean D.
AD35 (Republican David Schoen vs. Democrat Michelle Gorelow and indie Daniel Hofstein) — Dems +550, slight D gain. Strong lean D.
AD37 (Republican Jim Marchant* vs. Democrat Shea Backus) — GOP +200, Dems gained a little. Lean R.
AD41 (Republican Paris Wade vs. Democrat Sandra Jauregui*) — Dem +470, gaining ground. Strong lean D.
I have been negelcting Washoe’s AD31, now held by Dem Skip Daly. 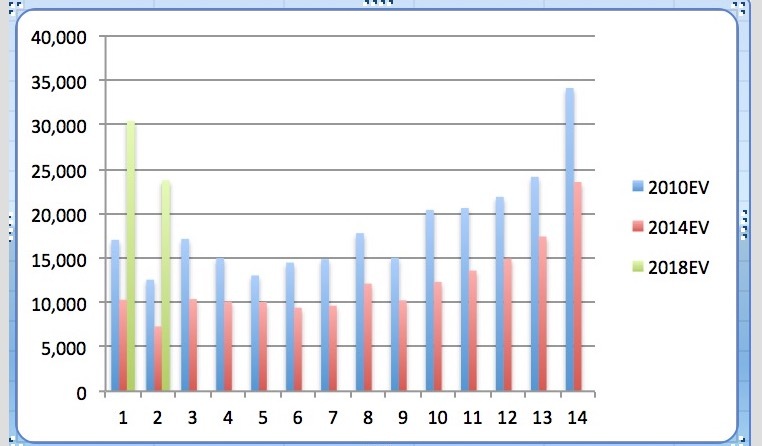 The GOP (Jill Dickman) has a 400-vote lead there, so it is Strong Lean R.
Unless the underdogs are getting bailed out by indie votes or the favorites are bleeding their base, it looks like this: Nine seats in play, five D, four R. Five lean R, four lean D.
Very unlikely supermajority as of today. 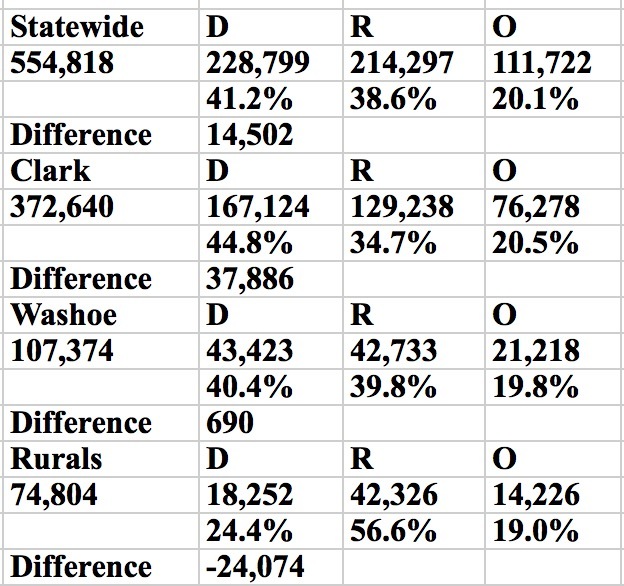 I’ll do some modeling later…..
Dems won Washoe (250) and Clark (4,000) and rural turnout was significantly lower on Saturday, although the GOP won by huge margins in the larger ones. Dems Clark performance was comparable to Day One, exceeding actual reg advantage (13 points) by 3 points (47-31). Total turnout about 25,000, so every day has been above 20,000 in the South. Clark firewall at 21,500 now. Looks like 30,000 is likely, 35,000 possible, 40,000 difficult. But GOP probably more concerned with Washoe after appearing to reverse trend there, losing for seventh out of eight days. But one day is….one day. The Dems also got off to a big start on Day One of the first week, too, before it leveled out. I’ll do some modeling and have more data tomorrow. For now, I’m going back to pretending I have a real life for a few hours. So you can see why Dems have problems in midterms, besides the downturn in minority voters. They lead voter reg in all cohorts 44 and under, which are voting in single or low double digits so far. Half of the GOP voters are in the two older cohorts, and they are voting at much higher levels. The Democrats are turning out fewer inveterate voters than the Republicans after one week. That could mean Election Day will be a wash this midterm or even an advantage to the Ds, depending on what happens during the second week. Big caveat. That also lends credence to the possibility of a GOP early turnout effort that is working well, but cannibalizing part of the Nov. 6 vote because their reliable voters are outpacing the Dem reliable voters. Let’s see if this changes in the second week, and it could also be affected if turnout is going to be way, way up this midterm. Here’s how much of the early vote is coming from 2014 voters (when turnout was way down) — 65 percent of Rs and 54 percent of Ds. Fifty percent of GOP mail ballots are inveterates (voted in last three elections) while only 41 percent of the Dem absentees are. Something else to keep an eye on, but also indicates potential cannibalization of Election Day vote. Let’s check these numbers again at the end of the second week, which will give us a better idea of what might happen on Election Day. News flash: The older you get, the more you vote. I’m not surprised at the younger voters and those small numbers. But the 40-49 number is most interesting. I hear more of those are Dems than normal this year. We shall see. CD3: Dems +725, some gains Friday but 93,000 ballots have been cast and 18,500 by indies. This is tough to call. CD4 (Steven Horsford vs. Cresent Hardy): Dems +6,100 in the Clark part, which is more than 80 percent of the district. Dems substantially in lead. Firewall getting big. By contrast, Horsford only had a 400-vote firewall in 2014. This may be slipping away for the GOP — no wonder they had Vice President Mike Pence with Hardy today. SD8 (Republican Valerie Weber vs. Democrat Marilyn Dondero Loop)— Still about even. Toss-up. SD9 (Republican Tiffany Jones vs. Democrat Melanie Scheible) — +1,100, Dems. Dems gained ground. This one looks lost to the GOP. SD20 (Republican Keith Pickard vs. Democrat Julie Pazina) — +65 Dems, lost some ground. Toss-up. AD2 (Republican John Hambrick* vs. Democrat Jennie Sherwood)— GOP +300, Lean R.
AD4 (Republican Richard McArthur* vs. Democrat Connie Munk) — GOP +240, big gain for GOP. Lean R.
AD21 (Republican Cherlyn Arrington vs. Democrat Ozzie Fumo*)— Dems +500, Ds gained ground. Strong lean D.
AD22 (Republican Melissa Hardy vs. Democrat Christee Watson) — GOP +320, moving toward the GOP. Lean R.
AD29 (Republican Stephen Silberkraus vs. Democrat Lesley Cohen*) — Dems +500, gained ground. Strong lean D.
AD35 (Republican David Schoen vs. Democrat Michelle Gorelow and indie Daniel Hofstein) — Dems +475, slight D gain. Strong lean D.
AD37 (Republican Jim Marchant* vs. Democrat Shea Backus) — GOP +250, gained ground. Lean R.
AD41 (Republican Paris Wade vs. Democrat Sandra Jauregui*) — Dem +370, gaining ground. Lean D.
The Dems need to net one seat for a supermajority. Unless the underdogs are getting bailed out by indie votes or the favorites are bleeding their base, it looks like this: Eight seats in play, split between the parties. Four lean R, four lean D.
A couple of charts for your viewing pleasure after one week. The first shows the percentage leads for the parties in all 17 counties; the second shows the turnout so far in every county, overall and by party. A note: Obviously pay attention to Clark and Washoe. 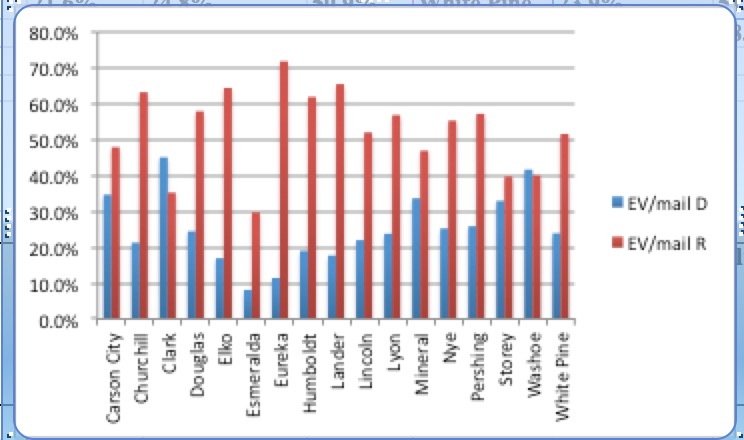 But in the rurals, the only counties with significant populations to look at are Carson City, Douglas, Elko and Nye (Churchill, too, perhaps, but it is not as large as the others). For instance, Esmeralda has only 27 voters so far; Eureka has 194 so far. One interesting result you will see: Dems are actually turning out in slightly greater percentages to their registration in some of the rurals. But the registration gap is so wide, it makes little difference. The Dem statewide lead in early/mail balloting is 4,700. That’s only 1.5 percent of the 309,000 ballots already cast. That ain’t much of a lead. Democratic turnout of their voters is 21 percent; Republican turnout of their voters is 23.5 percent. That’s not unusual for a midterm. That means the Democrats have a 41 percent to 40 percent lead in the overall vote — about 4 points under their registration edge thanks to the slight GOP turnout advantage, which also is not that anomalous for an off-year election. Total turnout is now about 20 percent. Hard to do extrapolations because this is much higher than a normal midterm turnout and just under three-quarters of the last presidential here. But it still seems to me that 60 percent turnout overall after Election Day is possible — that would be 900,000 voters. And we might get to 1 million, or two-thirds of registered voters. Early and absentee voting is a much higher percentage of the overall vote (in presidential years (about 70 percent) than it is in midterms (mid-50s or 60 percent). And because it is a different kind of year, we still don’t know if Election Day will be lower than usual and which party has an advantage — Dems can win Election Days in presidential years but they almost never do in midterms. Bottom line is it is close. Southern turnout is going to be well above 2014 in raw numbers — more voted early in the first week in Clark County (181,000) than voted in two weeks four years ago (171,500). Yes, there are 200,000 more voters in the South now, but you get the picture. In Clark, where the Democratic goal during early voting is to build a ballot firewall using a double-digit registration edge, the advantage is about 17,500 after one week. (The Democrats won by their second-largest raw-vote margin — 2,900 ballots) on Friday, their largest since a big opening day a week ago. Perspective: The Republicans had a slight ballot lead after early voting in the South during the red wave of 2014, and the Democrats had a 25,000-vote edge two midterms ago when they saved Harry Reid’s re-election. They appear on target to get to 35,000 — assuming no odd reversal in trends, with an outside chance to get to 40,000. Either would be a big number for a midterm — 35,000 would make the Dems feel pretty good; 40,000 would make the GOP worry, I think. In Washoe, the Democratic ballot lead is down to 600. The Dems won early voting for the sixth day out of seven in the county where the GOP has a 37-35 reg edge, but lost absentees by twice as much. The Republicans likely will end up winning Washoe by the end of early voting. The Democrats just want to keep it close in the swing county where Hillary Clinton eked out a win but where Dean Heller crushed Shelley Berkley in the 2012 U.S. Senate race. Keep an eye on those Washoe numbers — I assure you Heller is! In the rurals — with only a few of the tiny ones not reporting — the GOP lead is 13,400. Turnout dramatically dropped off in Lyon (900 to 100) on Friday –a Nevada Day holiday effect, perhaps — and a little less precipitously in Douglas (900 to 650). I doubt that decline is a harbinger of anything, but we will see. About 58,000 non-major-party voters have cast ballots, holding steady at about 18 percent. People keep asking me how they lean. We don’t know, and there is conflicting evidence in polls. There is some data that indicates indies and undecideds are anti-Trump, but I am sure the Dems do not take much sustenance in that right now. So after one week, we know this: The Senate and gubernatorial polls that showed those races very tight appear to be correct. But we still only have one week of data, and this weekend will show if the second week, as always, is primed to be much larger turnout than the first. If the Dems can build up a Clark firewall to a large enough number — I think 40,000 or so would make them happy — and hold Washoe close, they will have an advantage going into Election Day. But if the GOP can not hemorrhage too much in the South, take a lead in Washoe and keep up the rural surge, they will feel good going into Nov. 6. I will be doing more digging into the data and will report back….at some point. —If Heller and Rosen are holding 90 percent of their bases and getting 5 percent of the other’s and each are getting 45 percent of indies: Rosen is ahead by 3,000 votes, or 1.3 percent. How indies vote is going to be critical, assuming both candidates are holding their bases. In 2016, Nevada exit polling showed indies went to the Republicans at the top by double digits, even though Democrats managed to win the presidential contest and Senate race here; if that happens again — and if 2018 is not 2016 — turn out the lights. Polling has shown that indies lean Dem this time, but that is…..polling. CD3: Dems +400, but GOP won the day here Thursday, cut lead in half. This is close. CD4 (Steven Horsford vs. Cresent Hardy): Dems +5,100 in the Clark part, which is more than 80 percent of the district. Added to lead. Firewall getting big. SD8 (Republican Valerie Weber vs. Democrat Marilyn Dondero Loop)— Still about even. This one is going to be close, I think. SD9 (Republican Tiffany Jones vs. Democrat Melanie Scheible) — +1,000, Dems. Stayed about the same. I till say: This is all but over unless there are some weird voting patterns going on or it reverses pretty soon. SD20 (Republican Keith Pickard vs. Democrat Julie Pazina) — +150 Dems, lost some ground. This one is close, too. AD4 (Republican Richard McArthur* vs. Democrat Connie Munk) — GOP +100, about the same. Toss-up. AD21 (Republican Cherlyn Arrington vs. Democrat Ozzie Fumo*)— Dems +450, Ds gained ground. Lean D.
AD22 (Republican Melissa Hardy vs. Democrat Christee Watson) — GOP +150, moving toward the GOP. Lean R.
AD29 (Republican Stephen Silberkraus vs. Democrat Lesley Cohen*) — Dems +400, gained ground. Lean D.
AD35 (Republican David Schoen vs. Democrat Michelle Gorelow and indie Daniel Hofstein) — Dems +425, about the same. Lean D.
AD37 (Republican Jim Marchant* vs. Democrat Shea Backus) — GOP +200, gained ground. Lean R.
AD41 (Republican Paris Wade vs. Democrat Sandra Jauregui*) — Dem +300, gaining gropund. Lean D.
The Democrats need to pick up one more seat for a supermajority. Eight seats in play, split between the parties. Three lean R, four lean D and one is a tossup. So: Right now, chances of a supermajority in either house are a toss-up. 271,000 have voted, or 18 percent. As I said, probably 30 percent of overall election vote is now in. 112,000 are Dems, 108,800 Republicans. So lead remains where it has the last few days, at about 3,200. Still 41 percent to 40 percent. GOP turnout advantage has turned 5 percent Dem reg edge into only a 1 percent advantage in the overall share of the vote. Democratic turnout is just under 19 percent, and GOP turnout is 21 percent, so a 2 percent advantage. None of this is shocking, folks. The Repubs were always going to turn out in greater numbers than the Dems, which is why that registration edge matters. I never believed in a wave either way this midterm, and there won’t be one. It’s not 2014 and it’s not even 2010, although not far from that. N.B: 50,200 non-major-party voters have cast ballots. That’s 18 percent of the overall turnout. Quick note: I have the absentee count from Clark now and the Dems outpaced the Repubs in those tallied Thursday. After trailing by 500 ballots for most of the early period, the Dems are now almost even — 70 or so behind. In the overall count, the Dem firewall is above 15K. Happy Nevada Day (celebrated), all. 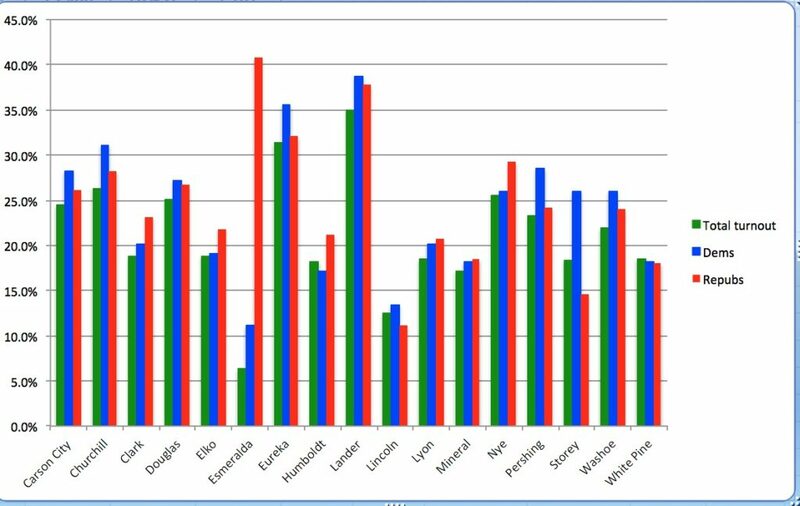 As I pen this first update of the day, the SOS shows nine rurals not reported from Day Six, with Lyon and Carson City the largest. Probably will increase the GOP lead in the 15 smaller counties by a few hundred. In the rurals the Democrats have just under 9,600 votes and and the Republicans have 21,400. After all of the counties have reported, the Republicans will have a more than 12,000-voter lead in rural Nevada. So look at it this way: The relatively tiny counties will have all but erased the Dem lead erected in Clark County. That shows again how key Washoe is, THE swing county in Nevada. It’s reasonable to assume that by the end of early voting the Democrats will have only a small statewide lead, and no nails will go unbitten the evening of Nov. 6. The Dem statewide lead is 109,000-105,200, or about 3,800. It will be about 3,500 or less by the time the rurals get in. The statewide turnout is 263,000, or 17.5 percent. Let’s say it’s 18 percent when the rurals come in. If total turnout is 60 percent by the end of the election, that means about 30 percent of the vote is in. And it may be higher than 60 percent. So where are we as we approach the end of the first of two weeks of early voting? This is not 2014, when Republicans led in every region and the red wave was evident. It’s still a little above 2010, when Dems had a 10,000-vote lead in Clark at the end of the first week (it’s close to 15,000 now but with 200,000 more voters). It’s also not 2016, despite partisans’ attempts to make apples to apples comparisons, which makes no statistical sense. Turnout first looked to be about three-quarters of a presidential year but it has slipped a bit: Clark is at just over 70 percent (proportionally, accounting for the new voters) of 2016 turnout right now. If you do a proportional comparison (i.e. see what 70 percent of 2016 numbers look like), the Democrats are nowhere near where they were two years ago (40,000-plus firewall in Clark after a week — and they will not get close to 70 percent of that by the end of today), which surely is giving the GOP sustenance. But it remains to be seen if any of these comparisons are apt or if this is a very different kind of midterm. Bottom line so far: If the Democrats keep up their current pace in Clark and get to a 30,000-vote firewall, the Republicans will feel they have done their job but no one will feel confident. And, of course, keep an eye on the ongoing rural surge and what’s happening in Washoe. I’ll have the updated numbers for you and some modeling later today. It will be interesting to see whether turnout rises or falls because of the “holiday.” The seventh day of the first week is usually a slightly slower day. Dems won Clark again, 45-35, added 2,200 to firewall, now closing in on 15,000 vote lead after six days. Another big turnout day — 23,000 — and all six days have been 20K-plus. I have said the Democrats need to get to at least a 30,000 ballot firewall in the South to feel comfortable and probably 35,000 to feel good. The former looks likely, unless the trend changes; the latter is doable, but far from assured. And just so we are clear: Neither number is a guarantee of victory for Jacky Rosen or Steve Sisolak. More tomorrow. Sleep well, fellow data geeks. Republicans have finally turned the tide in Washoe, winning today by 200 votes. And winning by 400 in absentees. Good day for GOP in the North. Combined totals: Dems, 21,594; Repubs, 20,885 (709 vote difference). So it’s 42 percent to 40.5 percent. Registration is 37-35, GOP, so Dems are 7 points above and Repubs are 3.5 points above. Some rurals are in, showing slight falloff in some places. Douglas and Elko still going strong, and Republicans have — wait for it — a combined 3,700-ballot lead in those two counties. The rurals are real, and for the GOP, they are spectacular. 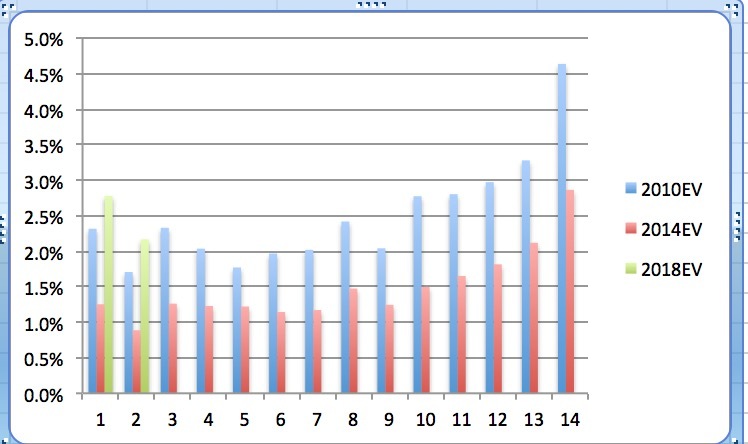 Of course, you can play around with these numbers on either side — maybe one is holding 90 and the other is closer to 85 with the bases and maybe they are getting more or less than 5 percent of the other’s — but you can see how little margin for error there is and why the ballot leads can mean so much. If Trump has helped Heller hold 90 percent of the base and Rosen can only hold 85 percent and they split indies, Heller is ahead by 1,800 votes, or .8 percent. In the governor’s race, Laxalt has much less margin for error because of The Bundy factor. If he is losing a few points more off his base than Sisolak, as you can see from those numbers, he is likely behind. Are indies really leaning D this time? If so, both top of the ticket Republicans are in trouble so far. If they can win them by a decent margin, though, the Dems are going to probably lose unless they can boost their ballot leads. I repeat my mantra on voter registration: It’s not determinative, but it matters. I will plug in the new early/mail numbers every day and tell you what they say. So just as the credible polls have said: Dead heat. Heller is beating the reg advantage for Dems by almost 3 points. So if the NYT crosstabs are correct — and there are things to question, including Latino numbers and Heller up by 9 among indies — if the Dems don’t have a 3 percent edge once the early/mail ballots are done, Rosen is in trouble. Take that for what it is worth. It just shows that a reasonable turnout model has the race even. I am going to start some of my own modeling soon, too…..
CD3: +940, Dems lost a little Wednesday. This one is too close to call. CD4: +4,000 in the Clark part, which is more than 80 percent of the district. Added 600 to lead Tuesday. Firewall building. SD8 — Still about even. This one is going to be close, I think. SD9 — +1,000, Dems. Keeps going up. This is all but over unless there are some weird voting patterns going on or it reverses pretty soon. Just checked Clark numbers, and it seems the SOS has failed to upload a big batch of absentees that were counted Wednesday. Dems won them by about 250 in Clark, so the statewide Dem lead is closer to 3,500. Most of Day 5 data is in. Rurals still helping GOP mitigate losses in Clark and Dem push in Washoe. Bottom line: Nye County absentee ballots finally apportioned by party and GOP won state Wednesday, so Dems lost 600 off statewide ballot lead. A little more than 219,000 have voted early or by absentee. That’s about 15 percent. Dems lead by just under 4 points in early voting and Repubs lead by 17 points in absentees, where more keep coming in and the margin is now more than 4,000. This is truly remarkable. Overall: 41.5 percent, Dems; 40 percent, Republicans. The GOP turnout edge has knocked about 3 and a half points off the Dem reg edge, which is 5 points. Again I say: See why voter registration matters. Dem statewide ballot lead is 3,200. Clark breakdown coming soon. Some interesting stuff there. Does five days a pattern make? —The Clark numbers have been fairly consistent. The GOP has had a turnout advantage, as expected, but the 13-point Dem reg lead has allowed them to build a 12,500-ballot lead. That’s 2.1 percent. Turnout usually goes up in the second week — another caveat: This is not a usual year so a 30,000-voter firewall remains a reasonable projection. That’s robust, but will not make either side feel good. Harry Reid won with a 25,000-ballot early vote firewall, but there were fewer voters in 2010 and…Sharron Angle. —Washoe has been a revelation for the Dems. They have won five straight days (absentees made it even on Wednesday) and have a 43-40 lead, or 1,500 ballots. In 2014, the GOP had a 50-37 lead by now, bolstering the red wave. Even if the GOP starts to win Washoe, as seems likely — they suddenly scheduled a GOTV rally, showing the concern in the North — the Dems will not do much worse than a draw here and could do better. I remind you again: Hillary Clinton won Washoe County, despite its GOP lean. —The rurals are coming in big for the GOP. The question is whether it will continue. I will have the updated numbers later, but there are two other questions, too: Is this early vote turnout a cannibalization of Election Day, and will the margins be Trumpian (big trouble for the Dems) or more like a regular midterm (long night for all Nov. 6)? —The GOP absentee ballot campaign has been impressive. The statewide lead is 3,500, as I write this, and will be a bit larger as the rurals report and those Nye Magical Mystery Ballots are counted. (The fact that these are not apportioned yet is going to start to make people wonder pretty soon. And by people, I mean me.) The lead, if that 1,700 Nye number is true, is at least 4,000 right now. I also wonder whether the absentee increase in Nye helps Adam Laxalt vis a vis Ryan Bundy, whose strongest county is supposed to be Nye. —Bottom line: I see possible patterns developing that lead to the inevitable conclusion that unless indies are skewing a lot one way or the other, the top two races are going to be close. Watch the behavior of the four campaigns in the final days, though: You already see signs of gutter politics — rumor-mongering, ugly personal stuff. If their internals show what I think these early vote numbers indicate, it’s going to be a nasty 10 days or so. —I have to give a speech this morning in Reno, but I will update all of this later this morning. Be patient! Dems won Washoe again, but by small enough margin that GOP absentee ballots negated it. 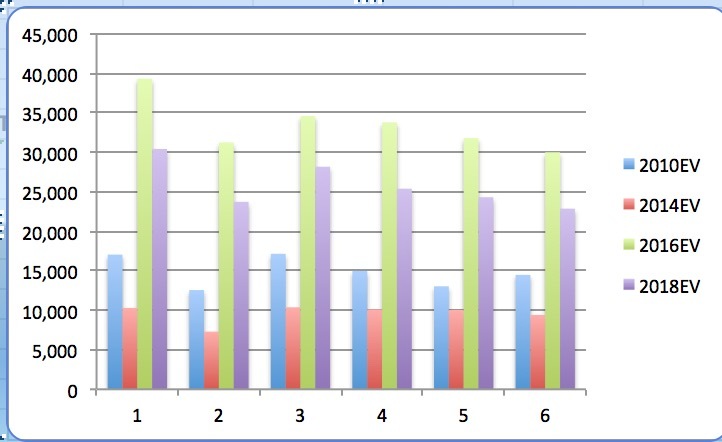 Net gain of four ballots for Repubs. Dem lead remains at about 1,300. Solid day for Dems in Clark — won 45-35, gained 2,300 ballots. Remember registration edge is 13 percent, so GOP maintains expected turnout advantage. But 137,000 more voters allows Dems to bank some more votes — lead is now 12,500. Not much in yet in rurals. Solid Douglas turnout again, and GOP ballot lead there is an amazing 2,400 ballots. Out of only 6,800 cast. With rural turnout up and the GOP destroying the Democrats there in early voting and absentees, here are two new charts for you. The first shows the percent of active voters who voted early the last four cycles in each region and the second shows what the percent of early and absentees in each region was of the overall vote in each region. 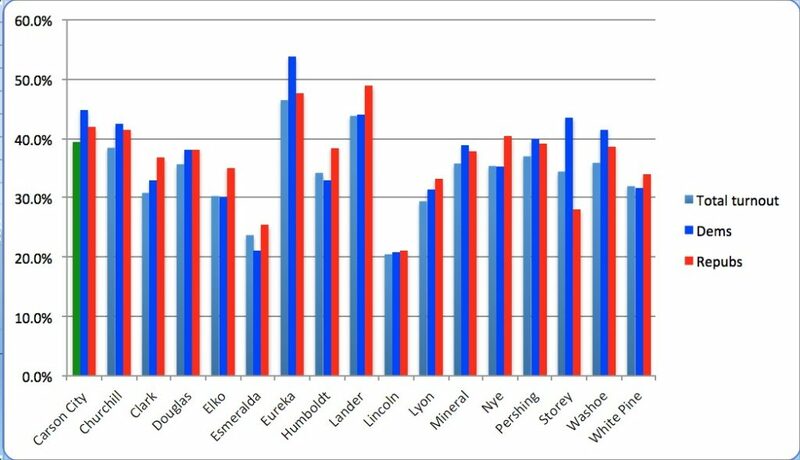 As you can see early voting and absentees are about 70 percent of the overall vote in the urban areas in presidential years, and the rurals inched toward that mark in 2016. In midterms, it generally falls below 60 percent. So far this cycle, rural turnout is at 14 percent, Washoe is at 12 percent and Clark at 10 percent. 156,000 have early voted, 22,500 have returned absentees (2,000 not counted yet because NEVADA and those Nye Magical Mystery Ballots). So total of 179,000 votes cast, which is just under 12 percent after four days. The rurals are keeping the GOP in the game, and that absentee ballot campaign is looking very smart right now. So the Dems winning Clark and Washoe and losing the rurals by a huge margin: That’s exactly how Adam Laxalt got elected four years ago, the only statewide candidate in modern history to lose urban Nevada and still win. CD3: +1,000, Dems doubled lead Tuesday. CD4: +3,100 in the Clark part, which is more than 80 percent of the district. Added 600 to lead Tuesday. SD9 — +825, Dems. Continues going up. I repeat: If this continues, it’s over. One state Senate seat is a pure toss-up, another leans slightly to Dems and another leans heavily to Dems. Supermajority possible but hardly likely. In the Assembly, of the eight contested Clark seats, four lean to Dems and the other four are too close to call. Rurals coming in: Dem statewide ballot lead down to 4,200, or 2 percent. Will drop even more, below 4,000 after Nye Magical Mystery Ballots are counted. Welcome to the latest in early voting in Nevada. Most of the data is in for four days as I write this. Bottom line of Tuesday: Dems won Washoe for fourth straight day, Dems won by double digits in Clark and the rural surge continued for the GOP (and 1,700 Nye absentees still not apportioned because county folks have not done so, SOS says). Statewide with some rurals missing: 43-38, Dems, in early voting; 49-34, GOP, in absentees. Overall ballot lead for Dems: 5,200 (probably closer to 4,500 once the Nye Magical Mystery Ballots are counted). 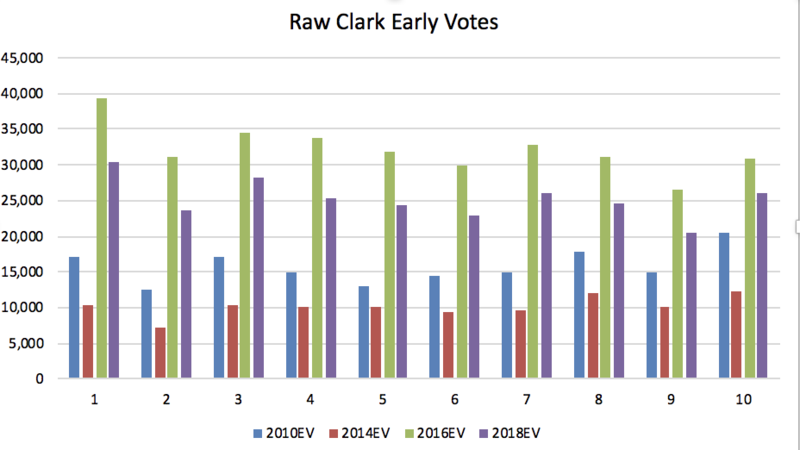 So 10 percent of Clark voters already have turned out after four days — still triple raw votes of 2014 and more than double 2010, although the percentage is just a little higher than 2010 because of all the new voters. It’s also holding steady at just under three-quarters of what turnout was in 2016, which ordinarily would not be a valid comparison but this is some kind of hybrid (between midterm and presidential) election going on, it seems. The Clark Dem firewall is at 10,000, which would be a just under 2 percent edge if turnout is 60 percent (reasonable guess at this point). An extrapolation says the edge could get to 30,000 — just under a third of the data is in and turnout usually spikes in the second week, so that is conservative. That would be 5 percent of early voting turnout IF it is 60 percent. 2010: 25,000-vote firewall, or 5.4 percent of Clark turnout. That was enough to save Harry Reid. But Sharron Angle is an apple to any orange. 2016, just for the heck of it: Clark firewall was 73,000, or 9.5 percent of turnout. So if this is going to be three-quarters of a presidential turnout, the lead should be about 7 percent, right? That would be 42,000, which is not impossible, but unlikely. I assure you of this: If the Dems get to a 40,000 firewall in Clark, the Republicans will be worried. If they get to 35,000, both sides will not feel comfortable, but the Dems will feel better. Anything 30,000 or less probably means we are in for a long night, and the GOP machine in Clark will have done its job. —-This is not your grandfather’s Washoe County — whether your grandfather was Paul Laxalt or someone else. The Washoe numbers have to worry the GOP. The Dems didn’t win by as much Tuesday, but they still built their ballot lead. If the Democratic candidates hold their own or even win Washoe — Hillary Clinton did — that means the statewide GOP candidates have to really run up the score in the rurals and minimize losses in Clark. A 10 percent win in Clark is what Dems look for, as I have told you. —-The rural numbers are impressive for the GOP, especially when you add absentees. So far (and some are not in yet and those 1,700 mystery absentees are not counted): 14,634 have voted early, 6,836 (!) by absentee, according to the SOS. Speaking of those absentees: The GOP has a 2,900 ballot lead (probably close to 3,500 once Nye is nigh). So the GOP probably actually has more than 60 percent of the ballots cast in the rurals. Wow. The rurals have picked up on early voting more in recent cycles, but the turnout so far is still only 7 percent of the total vote, well under Clark’s percentage. It’s still not clear if this is cannibalizing the Election Day vote. If not, this is very bad news for the Dems. Should know more by the end of the first week. Bottom line: No wave to see here. Non-major-party voters (30,000-plus so far) could be the deciders. Last post of day. Clark in. Dems add 2,500 votes, robust day. 11,500-9,000 or 45-35, 3 points under actual 13 point reg. Big turnout again: 25,400. Firewall is at about 10,000 after four days. Washoe in, fourth straight Dem early vote win, but absentees give GOP a slight win. 43-39, Dems. 1,300 votes. So Dems are 8 points above reg and Rs are 2 points above theirs. In rurals, big days in Douglas and Nye, and the Rs now have a 3,000-vote lead combined in those counties, which does not include 1,700 absentees from Nye, which can be expected to add at least 500 to that lead. Are these rural voters just cannibalizing Election Day? Or new voters? You’ll know when I know. Data entry error at SOS missed 1,000 votes in Clark, now updated, and the missing absentees also are in, although without partisan breakdowns, which is weird. Those 1,700 Nye absentees are going to cost the Dems another few hundred off their lead when they are tallied. New totals: 134,725 voted early and by mail. Not much change in Clark lead at all. Also, two small counties reported today. Only 100 votes. Big news: The Republicans won Nevada on Monday, by 400 votes, reducing the Dems statewide lead to 3,800 votes, or 42 percent to 40 percent. That means the Dems are now about 4 percent over their registration and Repubs are 6.5 percent over theirs. All numbers are in for three days, with this caveat: nearly 2,000 absentee ballots (1,700 in Nye!) from a handful of rural counties have not been counted because they have only provided the secretary of state with totals (danger, Will Robinson!). Those will help the Rs. My guess is the mail ballots will reduce the Ds lead by another 700 votes or so. 114,491 have early voted and 16,503 have returned absentee ballots. That’s 130,994. So let’s call it 131,000 voters, or 8 percent of the vote. Overall turnout may not get past 60 percent, so that’s pretty substantial. —I know the inclination of many Dems will be to assert that the rural Republicans are cannibalizing their Election Day vote, which usually goes substantially to the GOP. Maybe. I’ll know more about these voters soon. And, yes, there may be many crossover votes among them, GOP women being more likely to vote Dem than vice-versa, and indies are important and may be leaning left, etc. But don’t grasp at straws if you are a Dem. Grasp this reality: GOP turnout is going to be high, higher than Dems. But the Dems will maintain a ballot lead, probably, because of registration. How big after 14 days, we have yet to see. I have mentioned the GOP absentee ballot campaign and how it is mitigating losses. Let’s keep an eye on how much more it grows during early voting; the statewide lead now is 2,400. Total rural turnout so far is only 16,882. But the breakdown: 9,626, Repubs—4,363, Dems. That’s more than 2-to-1 and subtracted 5,300 votes from the Dems’ early-voted lead. Damn. We ARE three states in one. CD3: +500 Dems counting mail, slight drop for Ds. 16,755-16,168. 40,632 have voted. So it’s 41-40 in this swing district. CD4: +2,500 in the Clark part, which is more than 80 percent of the district. Added to lead Monday. 14,488-12,026. But those rural numbers have to be a bit worrisome. SD9 — +700, Dems. If this continues, it’s over. GOP turning around some of those districts in the Assembly and holding their own in two of three key Senate seats. But one, where they have high hopes for Tiffany Jones, is looking very shaky unless she is getting a ton of indies and crossovers. Mike Dayton, a former GOP operative here, pinged me on Twitter and suggested I should compare what is happening now to the last time Sen. Dean Heller was on the ballot, which was 2012. It’s apples to oranges in a sense because it was a presidential year with much larger turnout ( 80 percent!) and Heller defied the usual Democratic wave here and a big Barack Obama victory. —There were 300,000 fewer voters six years ago, but the Democrats built their usual massive presidential year firewall in Clark: 50,000-plus. It will not get nearly that high this year, but it is a midterm, so that isn’t a good comparison. As I have said this year and others, statewide, Dems generally need to win Clark by at least 10 points to offset losses elsewhere. Anything less is asking for trouble. Heller lost Clark in 2012 by….9 points. And he won by fewer than 12,000 votes, or 1 percent. —Heller won Washoe by 20,000 votes in 2012. Those Washoe numbers this year, with the Dems winning three days in a row, have to concern him. —Heller won the rurals by 40,000 votes. Polls show he is running strongly there again, and his embrace of Trump might amp his margin there this cycle. —Jacky Rosen is not Shelley Berkley. Berkley was a much more established pol, but she had the albatross of a House Ethics probe that helped Heller squeak by. His team also pushed enough people to vote for a third-party and None of the Above to make the difference. Not sure that tactic, although it is being employed again and I sense the worst is yet to come, will bear as much fruit. —Having said all of that, I repeat my mantra of 2018 vis a vis the Senate race: Dean Heller has never lost a race. —It does not appear yet to be a wave election, as it was in 2014 (red) and 2016 (blue). But this is not like the last two midterms — the 2014 red wave or the 2010 Reid Machine that saved Reid but had mixed results. It looks now like an unusually high turnout year for a midterm, three quarters of the last presidential year (2016). What does that mean? Let’s wait a few more days (at least) to talk about patterns. I have been skeptical of any blue wave theories from the beginning, especially with polling showing the top two races so close. The Democratic goal, as it always is in early voting, has been to use its substantial registration edge in Clark (137,000) to bank votes to make up for higher GOP turnout. And the GOP absentee ballot campaign this cycle clearly has been robust and has helped mitigate Dem gains. I will keep repeating this: Republicans crush Democrats in turnout in midterms here; that’s why Dems always emphasize building a lead. 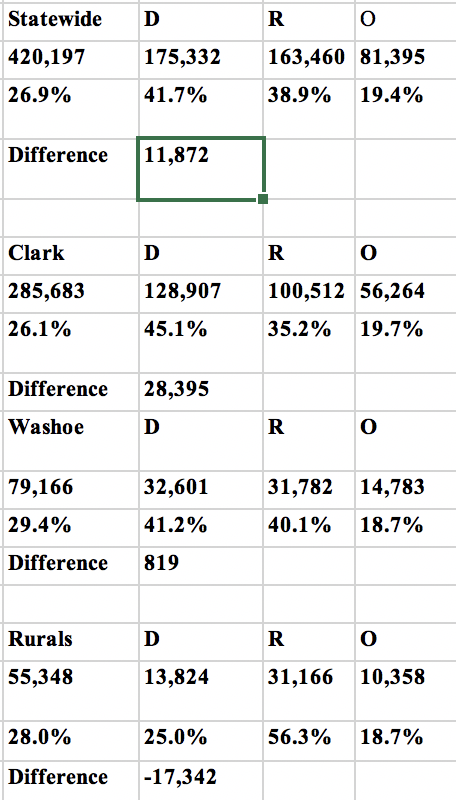 So far: Clark turnout (9,000 votes banked in early voting – 8,500 if you include mail) is good for the Dems, and Washoe is very good for the Dems (the 2,000-vote lead is unheard of) — but the rural surge/absentee ballots count on Monday has to make the GOP feel good. Again: Only three days of data. The GOP had friendly sites the first three days, and the Democrats have to be wondering whether these rural voters are new (or whether the Rs are cannibalizing their Election Day vote) — and they also have to wonder whether they can keep up those Washoe numbers. Let’s look at the data and drill down – keep in mind not all rural data is in, and that it will reduce the Democratic lead. —The total statewide Dem ballot lead is 4,800 votes. 48,971 Democrats and 41,734 Republican shave early voted, but the Republican absentee ballot campaign (8,000-5,500) has reduced the Dem lead. I’d guess it’s actually about 4,500 or less after all of yesterday’s rural vote is reported. That’s a flip of 2014, when Republicans had banked a 5,000 voted lead statewide by this time. Remember, though, there are 300,000 more registered voters in the state than in 2014. —Clark: The Dems have been slowly banking votes, but the GOP machine is working well. It’s 37,504-29,439 in early votes, so an 8,000-vote lead. Add in absentees and it is 40,825-33,239. So, 7,500 after three days. It was even after three days in 2014. The turnout in Clark is huge: 82,000-plus (91,000 with absentees) compared to 28,000. So it is a 3x 2014 year in both urban counties. —Washoe: Three straight days of decisive Dem victories is stunning, but as the president often says: Let’s see what happens. 9,150-7,071 in early voting; 10,375-8,892 with absentees added — so an almost 1,500-vote lead for Democrats. It was 1,000 to the good for the GOP four years ago at this time in Washoe. A little more than 23,000 votes cast so far in Washoe; that’s three times what it was four years ago. It’s 45-39, Dems; actual registration is 37-35, GOP. So Dems are 10 points over reg in Washoe so far, and GOP is up 2. That has the makings of a Washoe Wave, but it is still a bit early to declare it. —Rurals: 5,314-2,317 in early vote, or more than 2-to-1. Add in absentees and it’s really impressive for the GOP: 7,675-3,326. More GOP absentees in rural Nevada than Dem early votes. That is no accident; they planned this. —So: Total vote is 127,000-plus. 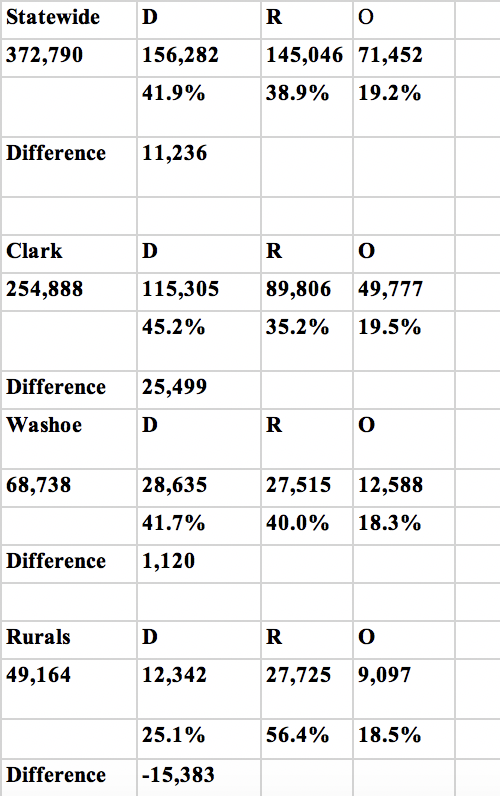 Clark has 72 percent; Washoe has 18 percent; the rurals have 10 percent. Actual numbers are 68-17-15. 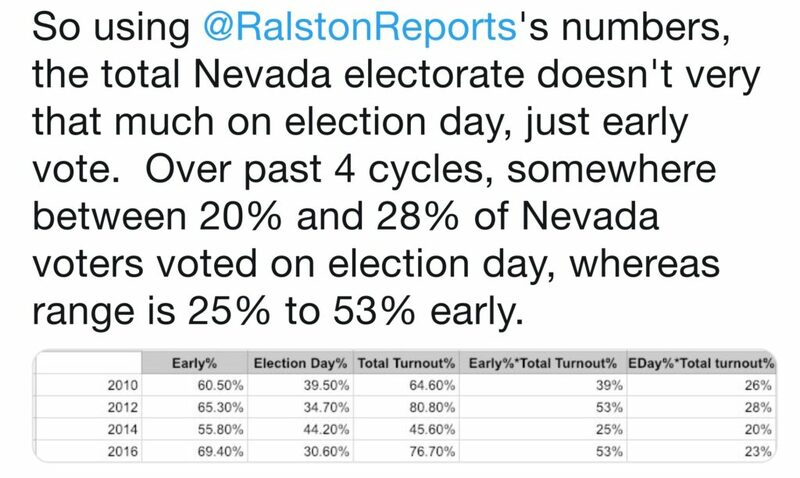 Remember, Clark voters always turn out early better than the rest of Nevada. This brings up that important question I mentioned earlier: Are these rural voters new voters or just cannibalizing the typical Election Day vote? The GOP always does better on Election Day, especially in the rurals, and did especially well in 2016, reducing the presidential and Senate race margins to make those close. I’ll let you know more when I do. 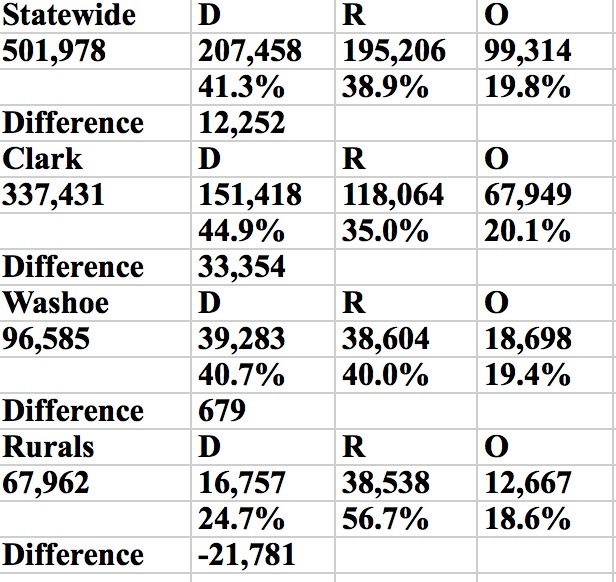 —Here’s why I have said this is closer to a presidential year than a midterm: After three days in 2016 in early votes, Clark had 105,000; Washoe had 25,000; and the rurals had 12,000. Remember, there are a lot more voters now, but in raw numbers , so far we have more than three-quarters of the last presidential election. —No big non-major party turnout: It’s 18 percent, or almost 10 points below reg. The real question is how these voters lean. Polls have shown towards the Dems, but that’s….in polls. Conventional wisdom also says there are more Repubs voting for Dems this time than vice-versa, especially moderate GOP women crossing over. But that is…conventional wisdom. —A deeper dive into the data, thanks to a helpful source, shows: Republicans are over-performing in CD4, but Democrats are holding their own in CD 1. Democrats are outperforming Republicans in CD3. As I told you, the polling sites have been favorable to the GOP so far, and the internal turnout number show younger Dems are turning out while younger Repubs are not keeping pace, especially in swingy CD3. I’ll keep an eye on this trend. —So where are we? The rural numbers have to concern Dems, although neither Adam Laxalt nor Dean Heller are likely to win them by 40 points, as Donald Trump did. But 30-plus? Maybe. 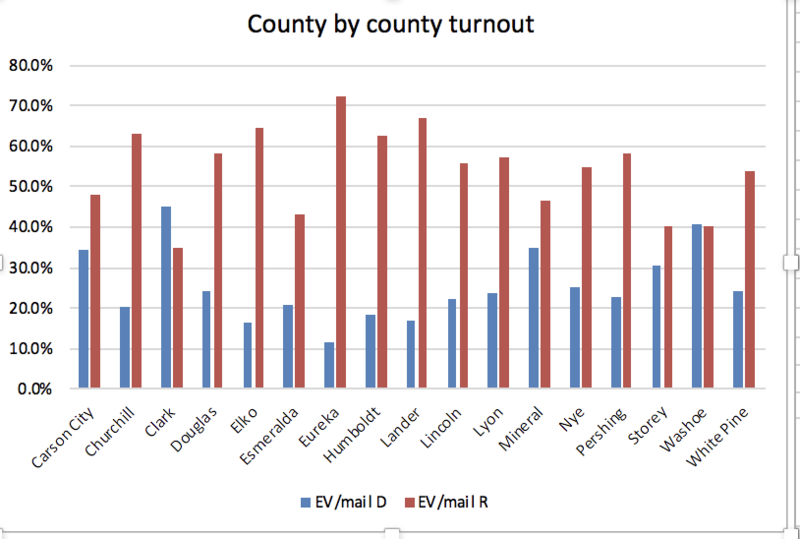 The higher percentage the rurals become of overall turnout is critical. Watch the banking of votes in Clark: If the Dems increase by an average of 2,000 a day, that will mean they will have a 30,000 or so lead by the end of early voting, which is a good but not an impenetrable firewall. If Washoe keeps going the way it is – hard to believe, but possible – that could negate any rural advantage and keep it true to its past role as the Nevada county that sometimes swings elections. Last update today: Dems increased their ballot leads in both urban counties today by a combined 2,600, but big rural turnout (Thanks, POTUS!) all but wiped out those gains. In urban Nevada, the Dem lead is now about 9,000 ballots after three days. Turnout is way, way up. In Clark, 28,000 voted Monday, with 12,300 Dems (44 percent) and 10,400 Repubs (37 percent). So GOP has turnout edge, as expected — 8 points over reg in Clark while Dems are 2 points over. It’s now a 7,500-ballot lead for the Dems in Clark — remember the GOP won Clark in ’14. In 2014 after three days, it was dead even between the parties in Clark. There was a rural surge today, though, which negated the urban numbers. The Dems have a 4,800 statewide lead as of now, — it was 4,200 as of yesterday — but several rural counties have not reported. It’s essentially going to be a draw for the day. In 2014 at this time, the GOP had a 5,000 raw vote lead statewide. One thing to note: A couple of insiders tell me the first three days have had favorable early vote sites for the Republicans. Let’s see what happens now. Third straight day of substantial Dem win in Washoe — 3,800-3,200. That’s 45-38. Added 600 to ballot lead, even won among handful of mail ballots counted. That’s just under three times what the Day 3 turnout was in Washoe in 2014; there were about as many voters today in Washoe as there were the first three days four years ago. GOP had a 1,000-ballot lead in 2014 after three days; this year: Dems have 1,500-ballot lead. Clark will be over 20,000 for the third straight day. Breakdown coming later tonight, I hope. Statewide: 70,170 voted early, Dems +6,000. 45-36, Dems. Actual reg, 38.3-33.5. So Democrats are about 7 points above their statewide reg and Republicans are 2.5 points above theirs. With absentees, it is: 86,433 voted. (This is the more meaningful number overall because voters are votes. 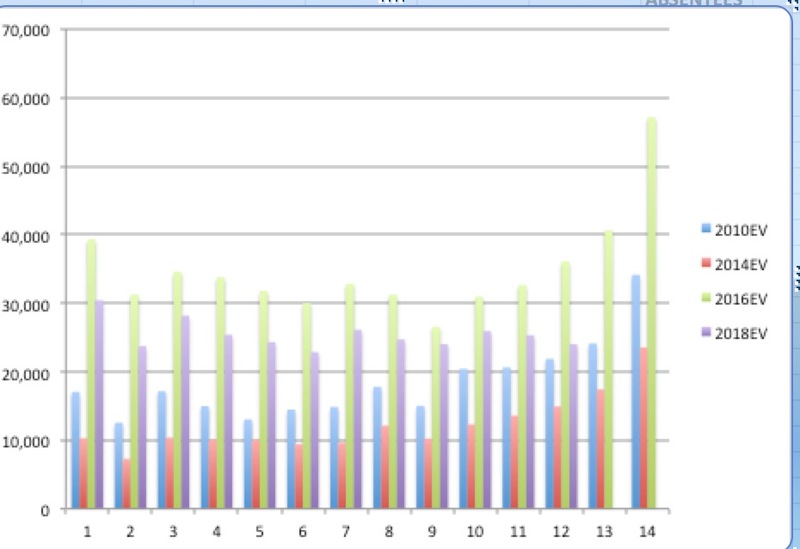 But I will track separately to show trajectory of early votes.) All votes cast: 43 percent Dems to 39 percent Republicans. So Dems are 5 above their regs and Republicans are 5.5 above theirs. Raw ballots overall: 3,800 lead for Dems. If the Republicans do well this cycle, their absentee ballot campaign will have something to do with it. So far, 49-34 over Dems statewide. 2,400 ballot difference. In Clark, it is 62,743 total ballots cast and Dems lead, 46-36. It’s actually 42-29, so Dems are +4 and Republicans are +7. Raw vote lead is 5,500. In Washoe, it is 14,666 total ballots cast and Dems lead 45-39. Actual is 37-35, GOP, so Dems up 10 over reg and Repubs up 2. Raw ballot lead is 900. In the rurals (remember just one day because they are closed Sunday), 9,034 ballots have been cast overall — 2,350 by Dems and 5,083 by Repubs. That’s 56-26. Actual reg: 52-23. So GOP up 4 over reg and Dems up 3. Raw ballot lead is 2,700. Of course the composition of the electorate matters, too. But the higher the turnout gets, the worse for Republicans, I’d guess. I’ll keep tracking this extrapolation. Here’s a chart that shows the raw vote totals by day in the last three midterms. I’ll update it every day. 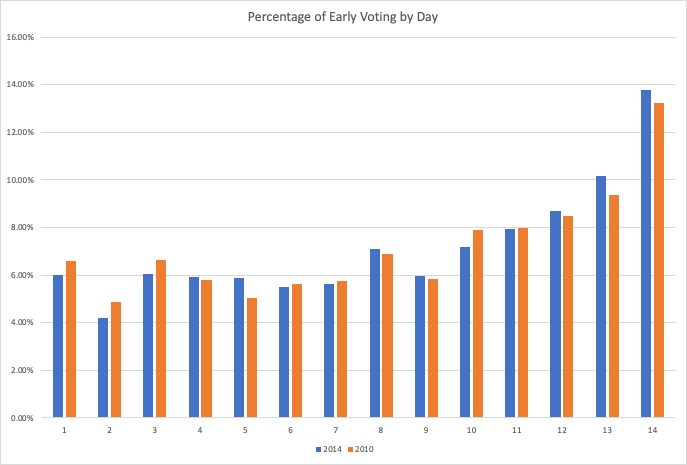 And here’s a chart that shows the percentage turnout relative to registration every day of early voting the last three midterms. I’ll update it every day. All but Lyon County accounted for now: statewide Dem lead is 4,200, with early and mail. —There was little excitement on the Dems side in 2014; they failed to recruit a gubernatorial contender, and the wipeout was top to bottom. Turnout was only 45 percent. Worth noting, though, that the two biggest upsets — Adam Laxalt over Ross Miller and Cresent Hardy over Steven Horsford — were very, very close despite the terrible turnout. In 2010, Harry Reid’s re-election brought some excitement and turnout was 65 percent. Reid won, but there was not a blue wave. The Dems won four of six constitutional offices, but some were against nonentity candidates. And Joe Heck eked out a victory over Dina Titus for CD3. The Republicans also won most of the contested state Senate seats, so there was no deep down-ticket effect from Reid’s win. I am not sure yet that the 2010 analogy works, but if it ends up being similar, that could be a mixed bag for both parties. Split for gov and Senate, and GOP gains down-ticket? Give me a few more days…. — We have not in recent cycles had anything approaching what we have this cycle: Super-competitive races for gov and Senate. In 2010, Brian Sandoval won easily over Rory Reid, which helped GOP folks down the ticket. This year may be sui generis. We need more data to say for sure. What’s really worth keeping an eye on is the GOP turnout advantage. If it gets up above 5 points, that could spell trouble for the Dems. They actually had a slight advantage in 2010 and a huge one in 2014. It’s the post-Reid-Era-machine vs. the RNC in the next 12 days. Two days of data in out of 14, and it’s not 2014. But it’s also not clear yet whether the wave is blue or purple — or if there will be a wave at all. It. Is. Only. Two. Days. —Turnout is way up in Clark compared to 2014, the last midterm. In two days, turnout in Southern Nevada was 54,000. That’s about 5 percent of active voters. In 2014, it was 17,500, which was 2 percent of active voters. So it’s double. In 2010, two midterms ago, it was 29,500, or 4 percent. So in terms of percentage turnout, Clark looks a lot like 2010, the year The Reid Machine protected its eponymous maker and built a firewall in Clark of 25,000 votes. That was enough to save him. Even though it’s apples and oranges, for those interested, here’s what happened in 2016 after two days: Turnout was 70,000, and Democrats were well on their way to building a firewall of 70,000-plus voters in Clark. That was 7 percent of the Clark electorate. So: 2018 is much more like 2010 than 2014 so far. But I don’t make trend pronouncements after two days. It’s not like a presidential year, but it’s also much bigger than the red wave year of 2014. —There is always a drop-off on the second day, a Sunday. That’s not unusual. The Republicans, who have made an unprecedented commitment to voter mobilization here, may be happy that they only lost by 1,500 or so votes on the second day in Clark. But they actually won Clark on the second day in 2014. This year they lost it by 7 percentage points. —The statewide numbers likely will be updated later today. The rural polls were closed Sunday and some of the Saturday numbers are not yet in. But with data from 11 out of 17 counties in for the weekend, the Democrats have a 10-point lead in early voting, 46-36, or 7,000-plus ballots. Add in absentees, and an important and aggressive GOP campaign, and the numbers are: 44-38 and 4,600 ballots. —The big story after two days is Washoe, where the Democrats have defied a registration advantage and have a 1,500-voter lead on early voting, which shrinks to less than 1,000 after absentees. If Democrats win Washoe, that would really upend conventional wisdom. Republicans won Washoe in early voting four years ago by 5.5 percent. —Keep an eye on rural turnout. In a few more days, I will have a better idea whether turnout there will be higher than usual for a midterm. GOP candidates at the top of the ticket probably need that bump to win. Remember, rural turnout was up in 2014, enough to carry Adam Laxalt to victory even though he lost both urban counties. We will need a couple of more days to have a gauge. —I’m also watching those voters not affiliated with major parties. They are below their registration by about 10 points, but how they vote could be pivotal. I will start doing extrapolations once more data is in, but no surge there detected. —Democrats increased their margins in the key congressional districts in Southern Nevada: 1,100 now in CD3 (+200 on Sunday, but GOP has a 500 mail vote lead so it’s really +600) and 1,900 (+400, GOP leads by 100 in mail) in the Clark County part of CD4 (which represents about 80 percent of the voters in the district ). —Still no conclusions to be drawn in Clark except it ain’t 2014, when GOP had a 22,000-ballot lead statewide after early voting. In 2010, the Democrats had 25,000-ballot lead after the two weeks, which is a possibility but….it’s too early to tell. Let’s see what President Obama does today, if anything, and if The Trump Effect is felt in the rurals. Dems won Clark by only 44 percent to 37 percent in big 24,000-voter turnout on Day Two — adding 1,500 votes to their margin in the South, but well under their registration advantage of 13 percent. The margin in Clark is now 6,000 — 5,500 if you include absentees. On Day Two four years ago, the GOP actually edged the Dems in Clark, signaling the deepening red wave. Turnout was only 7,500. It was even after two days in 2014. The Dems were never able to build any kind of firewall in Clark, as they are attempting to do this cycle. So: not as robust a day as Saturday for the Dems, who were 2 points above their registration while the Republicans were 8 points above theirs. Overall, Dems have a 43-35 lead in Clark in early voting, so Dems are 1 point above reg and Republicans are 6 points above theirs. That’s why the Dems focus so much on voter reg in the South — they know the Republicans will have a turnout advantage, so they can only build a lead if they have many more Dems. In the urban counties, the Dems now have about a 6,500-plus voter advantage counting absentees. About 11,500 non-major party voters have cast ballots. More details in the morning, but still too early to see a trend. Barack Obama is in Vegas at UNLV to try to juice turnout. Clark polls are closed, numbers should be out soon. At least three times as many people had voted as in 2014 on the second day. —Dems say they have a 14-point lead among all votes counted in this cohort: New voters, those who have not voted in last three federal elections. Let’s see if that keeps up. —Comparisons to 2016 are not apt, people. It’s 2014 or maybe 2010, as you can see in my initial post. 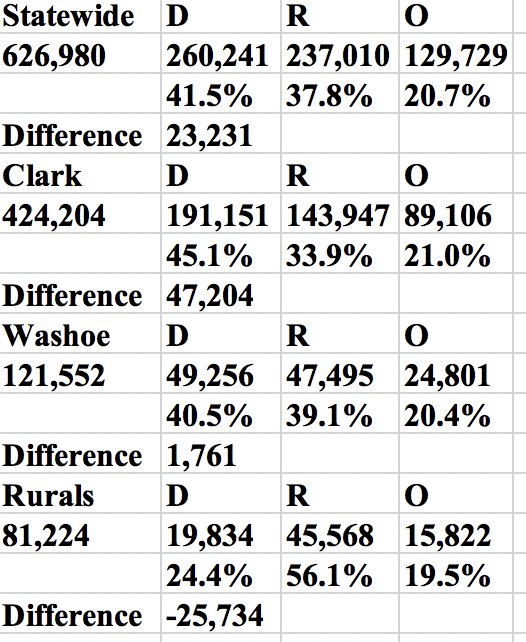 —Forgot to post Washoe comparison: On first day in 2014, GOP crushed it, winning absentee and EV by 1,000 votes. 48-36 in early voting, nearly the flip of what happened Saturday. —Remember: This is just ONE DAY, which does not a trend make. A one-day blue wave — aberration or harbinger? It was a big day for the Democrats on Saturday, the first of 14 days of early voting, which generally makes up 60 percent of the vote. Turnout in Clark County was near-presidential year levels, with 30,000 voters turning out and Democrats winning by about 4,500 votes: 14,735-10,210. That’s 48 percent to 33 percent, which means Democrats were 6 percent above their registration and Republicans were 4 percent above theirs. So the Democrats, who need to build a firewall in Clark, have a 4,500-vote lead. In contrast, in 2014, that lead after the first day was nonexistent, signaling a red wave. There was no southern firewall in 2014, so the Republicans swept everything. Turnout also was a third of what it was this year. 2018 is not 2014. Perhaps the even bigger news was in Washoe County, where Republicans have a 2 percent registration edge, but the Democrats won 49-34: 3,409-2,365. That never happens in Washoe. So in the urban counties, the Democrats amassed a 5,500-vote lead on the first day. That is a big number for a midterm election, albeit only one day of data. Absentee ballots amassed during the last few weeks in Clark and Washoe, helped cut into that Dem lead. In Clark, it’s a 400-ballot lead for the GOP and in Washoe, it’s a 550-ballot lead. So the actual early/mail lead for the Dems in the urban counties is about 4,500. My guess is after all of the first day data is in, the Dems will have a 4,000-voter lead or so. Much of that lead, though, will evaporate with absentee ballots, where the GOP will have a 3,000-vote or more lead statewide. Those numbers will slow down now, but worth keeping an eye on. Not all of the rurals are in, but those numbers seem relatively normal so far. Fun fact of the day: On the day President Donald Trump did a rally in Elko to rev up the base, drawing an estimated 8,000-plus, only 435 people voted in Elko County, 250 of them Republicans. Bookmark this page to get the statewide results as they come in. I want to again emphasize this is only one day, but trends develop quickly in early voting in Nevada and rarely reverse themselves. Will this year be different? The turnout on the first day in 2016, the last presidential year, was 39,000 in Clark. So this was closer to an on-year than an off-year. Did the Democrats go all-out on the first day but find they won’t be able to keep up their pace? Or is this the beginning of a blue wave? Fact is, the Republicans did a good job in Clark, coming in at 4 percent above their registration numbers. But they were no match for the Democratic machine, which held the double-digit edge in Clark they built in order to erect that firewall. Four years ago, the GOP was at 10 percent above registration and the Dems were at theirs, leading to the red wave. Have I mentioned that 2018 is not 2014, at least so far? Turnout almost surely will drop off on a Sunday, and only the urban counties are open for business. —Democrats crushed it in every congressional district in Southern Nevada, winning by 2,100 in CD1, 900 in CD3 and 1,500 in the Clark County part of CD4 (which represents about 80 percent of the voters in the district ). Watch those numbers, too. If they can build enough of a firewall in CD3 and CD4 by Nov.2, that’s very ominous news for the GOP. Those are all big leads in the key Senate districts. So the one-day wave went wide and deep, but the GOP did better in some races than others. And in all of those districts, the GOP has a lead in absentee ballots, so the races are all close. The question (again) is whether the trend continues. —In case you were wondering, non-major party turnout in Clark was 18 percent of the total. So nothing really strange there. But if Republicans crush it among indies – and no polling has shown that to be so – they can still do very well. I’ll have more numbers and analysis for you as I can. Big turnout in Clark on Day One– 22,000 by 3 PM. That’s more than double what it was for all of Day One in 2014. 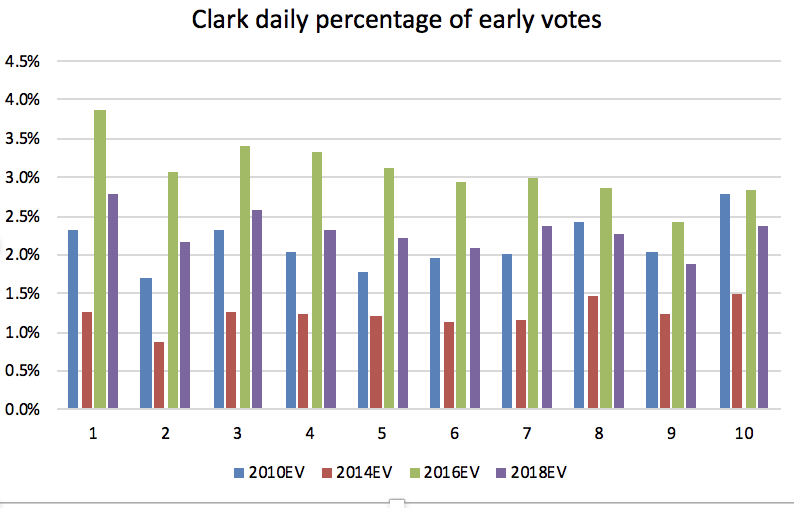 Registered voters increased by about 25 percent in Clark since 2014, but first day Clark turnout is going to be at least 2.5X that, probably more. Going to be interesting to see partisan breakdown, but these sound like Reid Machine numbers. We will know soon. Final reg numbers finally posted. —The SOS has yet to post final reg numbers, but the Dems will have about a 75,000-vote statewide lead, or about 5 percent, and 137,400 in Clark County, or just under 13 percent. Washoe numbers are in and the GOP lead is at 5,100 voters, or 2 percent. Clark was 13 percent in 2014 and Washoe was 3 percent GOP four years ago. Rural numbers not in yet, but the GOP will have about a 35,000-vote lead there, or about 30 percent. It was about 23 percent four years ago. You see why the GOP sent Trump to the rurals Saturday. Higher that gets, better the Republicans top to bottom will do. 4,386 Dems to 4,273 Rs. Dead heat in Clark, with Dems just under their registration and Republicans 10 points (!) above. It was a harbinger of the red wave to come as the GOP held its own the entire early voting period in Clark. Both sides trying to make a statement today. I’ll give you numbers when I have them. Forget what the polls say. They nearly never tell us much anyhow. On Saturday, real data arrives as the early voting fortnight begins. I will, as I have every cycle, be tracking the numbers and using my experience and the expertise of others to divine what they mean. 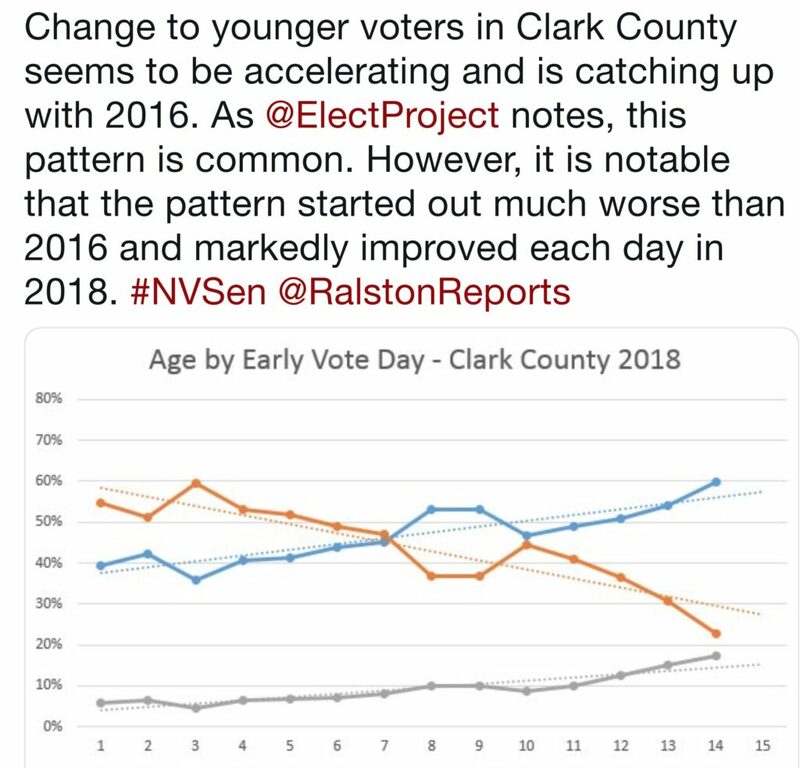 These numbers will tell us a lot because early voting generally makes up about 60 percent of the vote, and it is especially robust in Clark County. One of the reasons Republicans started gearing up so early this cycle and made renewed ground efforts is because they know what the Democrats know: If the Democrats can bank enough votes in Clark County during early voting, as they almost always do in presidential years but struggle to do in midterms, what happens in the rest of the state may not matter. It was clear after early voting in 2012 and 2016 that the Democratic presidential nominee was going to win Nevada. And it was clear after just a few days of early voting in 2014 that there would be a red wave. But in a way, the last two midterms are not great baselines to use. 2014 was anomalous because Democratic turnout, almost always lower than GOP turnout in midterms, was unusually low. Clark turnout, where Dems hope to prosper, was only 41 percent while rural turnout was close to 60 percent. And that’s all Cresent Hardy (CD4) and Adam Laxalt (AG) needed to squeak by. 2010 was also a strange year because of Harry Reid’s unprecedented U.S. Senate campaign and his machine. Clark turnout was 63 percent, just under the statewide total of 64.5 percent. By the end of early voting, Democrats had built a 25,000-vote firewall in Clark, enough for Reid to win. So neither year may have been “normal,” per se, and yet early ballot numbers have been remarkably predictive in major races. Democrats mostly are voting for Democrats; Republicans are voting for Republicans. Tallies are therefore fairly predictable, and most predictive in Clark County, where early voting turnout is usually the highest and where there are the most votes of any county. You may think elections are about the best candidate or the most money. But, ultimately, they are about one thing: math. —The first day is not determinative, but it usually is a harbinger. And both sides try to make a big statement on Day One. In 2014, the Republicans were almost even with Democrats in Clark, which I knew was a harbinger of doom. And doom it was as the Republicans swept the state. All this is why the Democrats always push voter registration so hard in Clark County. They know they need that advantage to offset a GOP turnout that will outpace theirs. If they have enough of a registration lead, they can still bank votes. The Democrats have almost a 13 percent edge in Clark County (about what it was four years ago). If they maintain anything close to that ratio through early voting, it will be a bad omen for the Republicans. If the GOP can slice into that lead, their machine is for real. Keep an eye on the Clark advantage. If it stays relatively low, it’s going to be a long night Tuesday for the Dems. —Regionally speaking, if Clark’s turnout is high, then its overall share of the eventual vote will be high. The higher the share the rurals get – the closer to 20 percent – the bigger problem for Steve Sisolak and Jacky Rosen. Republicans have about a 2 percent lead in Washoe – slightly less than four years ago – so those numbers are worth watching, but they will only mean a lot if one party has a large advantage in early voting, which is rare there. Remember: The increased rural share in 2014 helped Laxalt win. 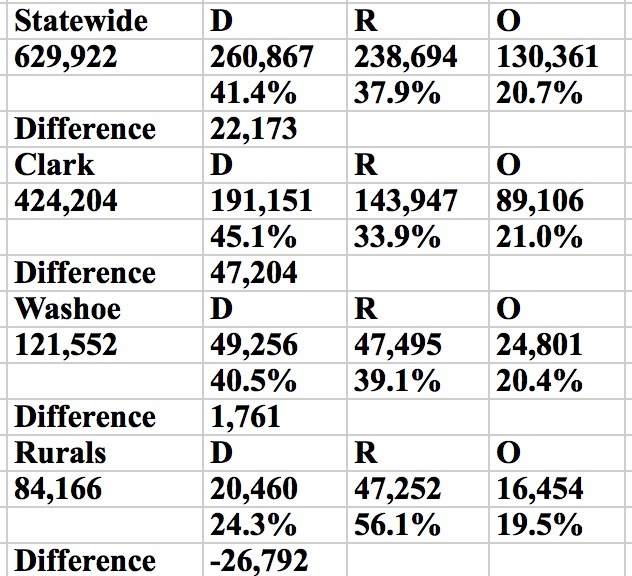 And Democrat Ross Miller won Clark by 19,000 votes and Washoe by 2,000 votes, but he lost the rurals by more than 25,000 votes (58 percent to 31 percent), which was astonishing. In Elko County, where the president will be Saturday, Laxalt won by a 3-to-1 margin and sliced 4,000 votes off Miller’s urban lead. Laxalt won by similar landslides in Churchill, Lyon and Nye. That’s why the Clark firewall is so important for the Democrats — and why they hope Ryan Bundy cuts into Laxalt’s rural firewall. —Thousands of absentee ballots will be cast before Nov. 6. Look for trends there, too. So far, in Clark, the Republicans have a 500-ballot lead out of 8,500 returned. It was about even after the first day in 2014. I am not sure if that is a harbinger of anything, but we will soon see. If these races do end up being very close, every little bit could help. —-The urban counties have become very good at updating their numbers, so we may have some data Saturday, which I may tweet and/or post. The secretary of state also has become very efficient in recent years in tallying the early votes of all counties, so this blog will be constantly updating starting Sunday morning.